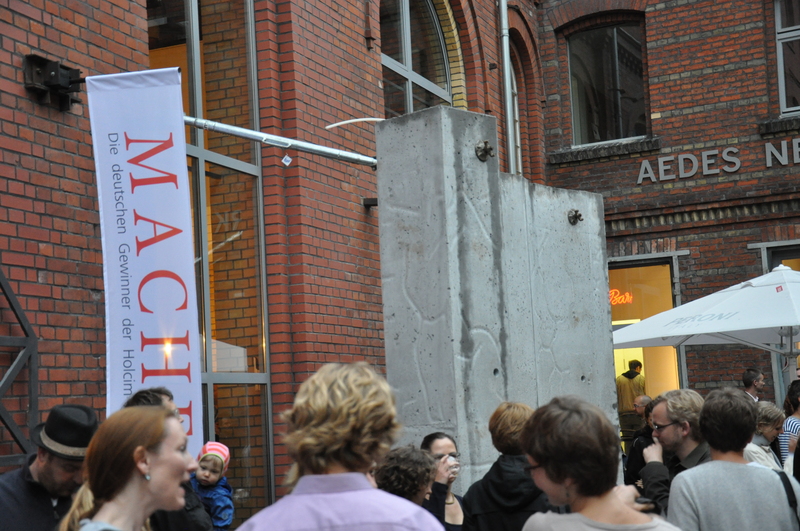 Project entry 2011: View from the street. 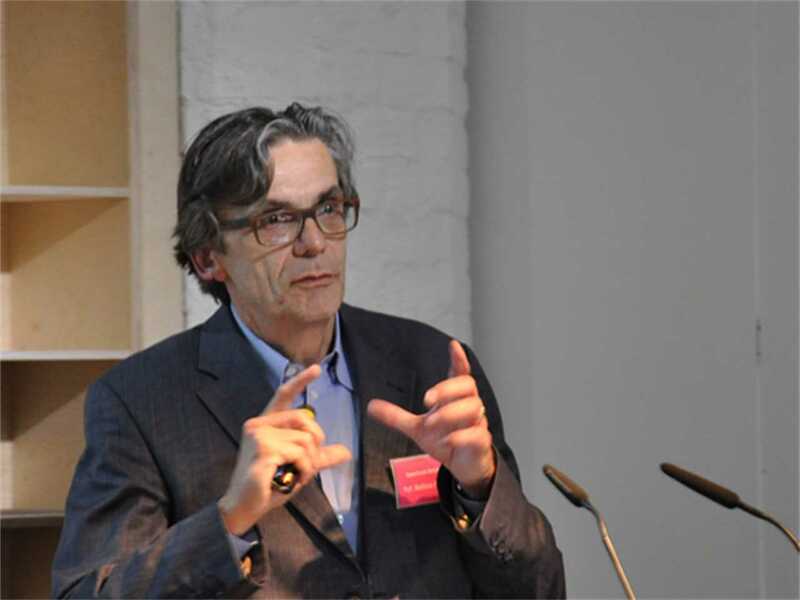 Werner Sobek, member of the Global Holcim Awards jury and Director of the Institute for Lightweight Structures and Conceptual Design (ILEK) at the University of Stuttgart. 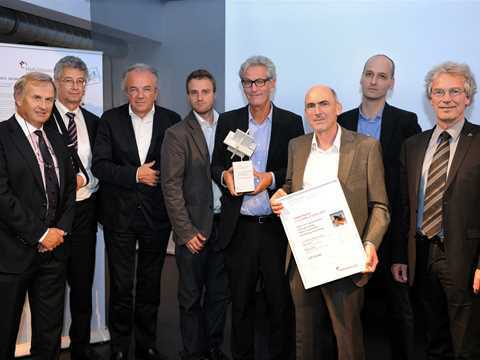 (l-r): Leo Mittelholzer, CEO, Holcim Germany; Roland Köhler, Member of the Executive Committee, Holcim; Werner Sobek, jury member; with prize winners Alexander Hückler, Frank Barkow, Mike Schlaich and Heiko Krech with Uli Hellweg, CEO, IBA Hamburg. 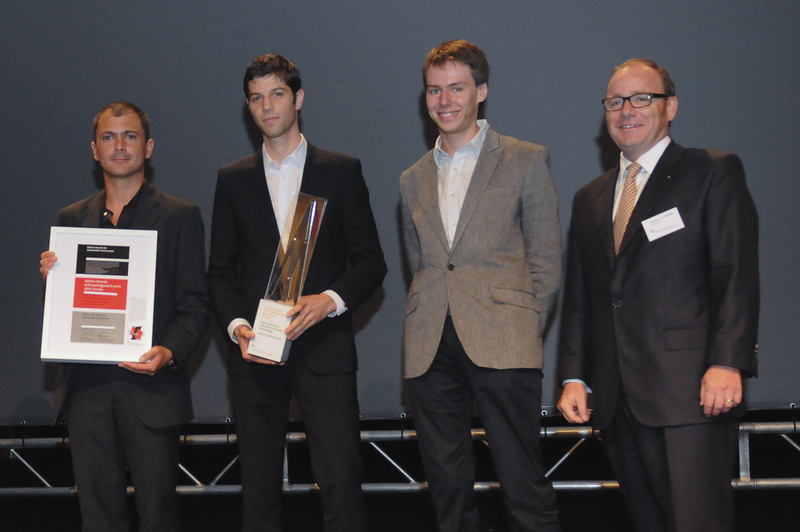 Members of the winning team for “Smart Material House” (l-r): Alexander Hückler and Mike Schlaich, Technische Universität Berlin with Frank Barkow and Heiko Krech, Barkow Leibinger Architects, Berlin. 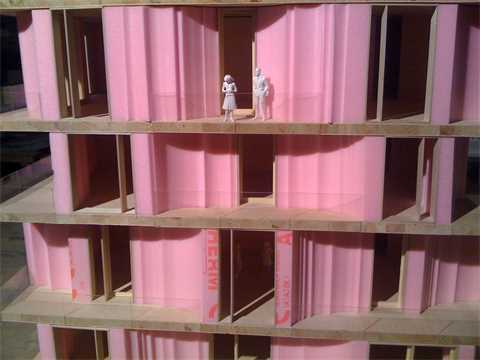 The walls will function as supporting elements, perimeter walls and also as thermal insulation. 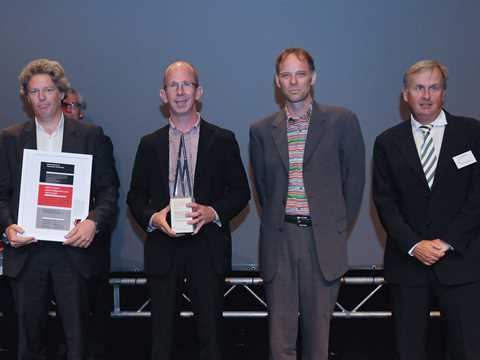 Presentation of the Global Holcim Innovation trophy (l-r): Leo Mittelholzer, CEO, Holcim Germany and Werner Sobek, jury member, with prize winners Alexander Hückler, Frank Barkow, and Mike Schlaich. Infra-lightweight concrete walls as load-bearing thermal insulation. 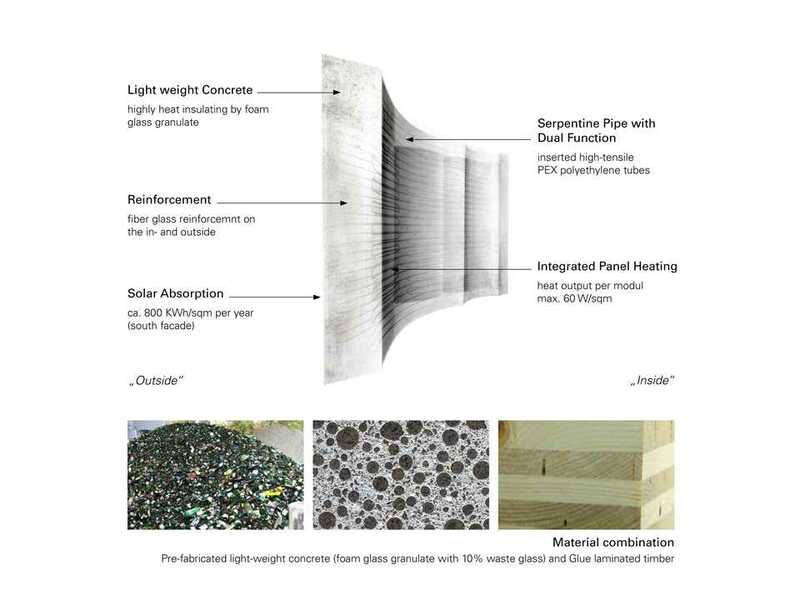 Weight is reduced through addition of recycled glass. At the discussion evening, Aedes Architekturforum, Berlin – August 3, 2012: Frank Barkow, Barkow Leibinger Architects, Germany discusses the “Smart Materials House”, a collaborative and experimental project that examines how to use materials in a smart and sustainable way. Façade detail (left) and material combination. 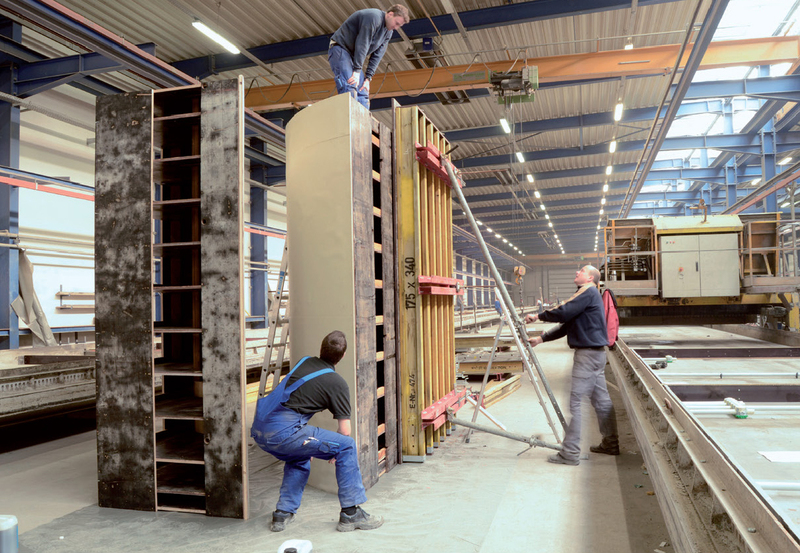 Making of the 1:1 protoype. 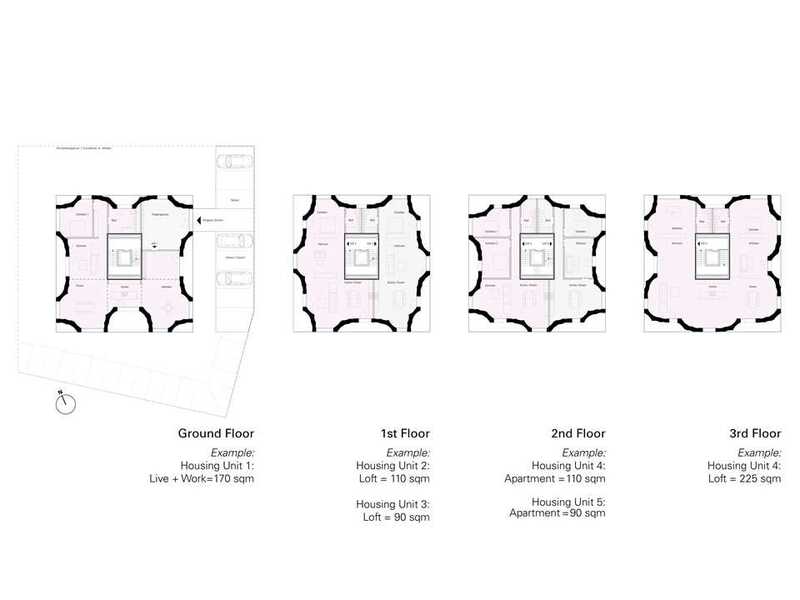 Project entry 2011: Location and site plan. 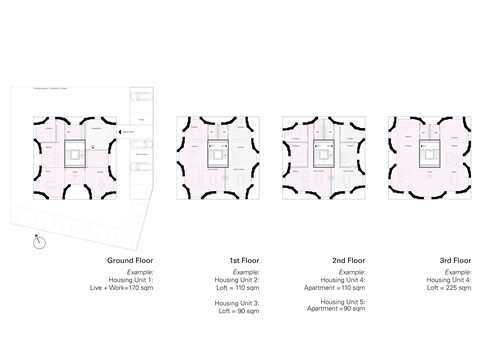 Project entry 2011: Floor plans. 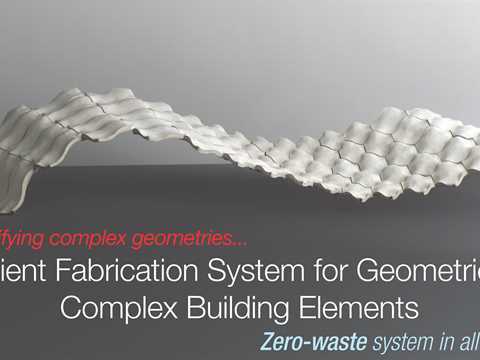 Project entry 2011: Material combination. Project entry 2011: Façade detail. 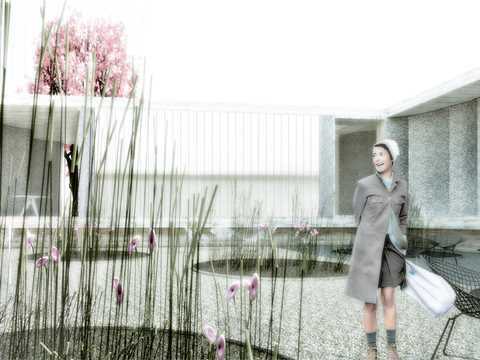 Project entry 2011: Energy concept. 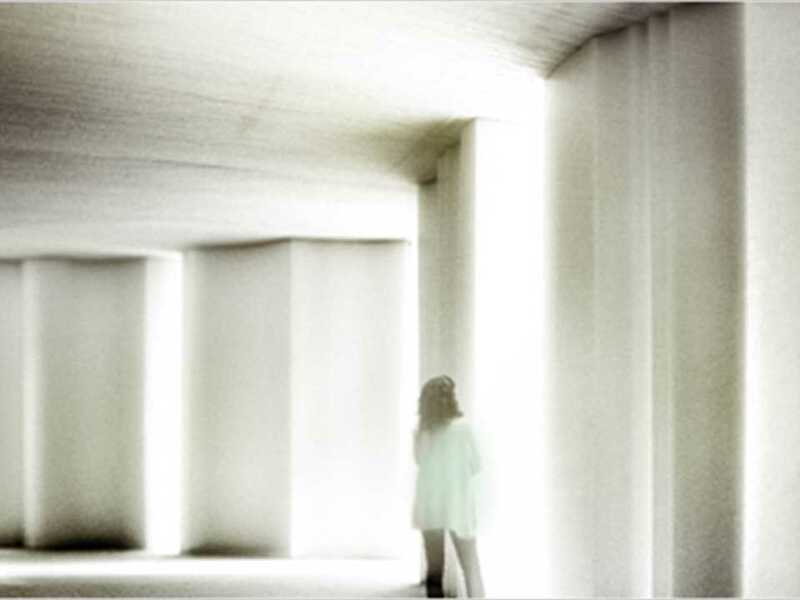 Project entry 2011: Model detail. 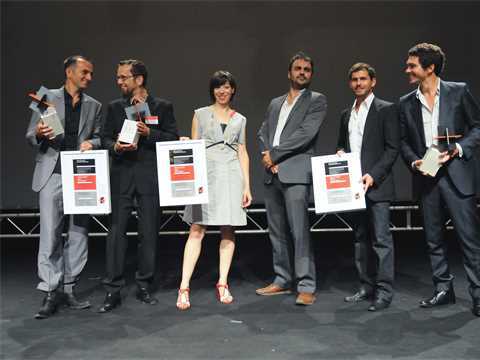 Project entry 2011: Team image. 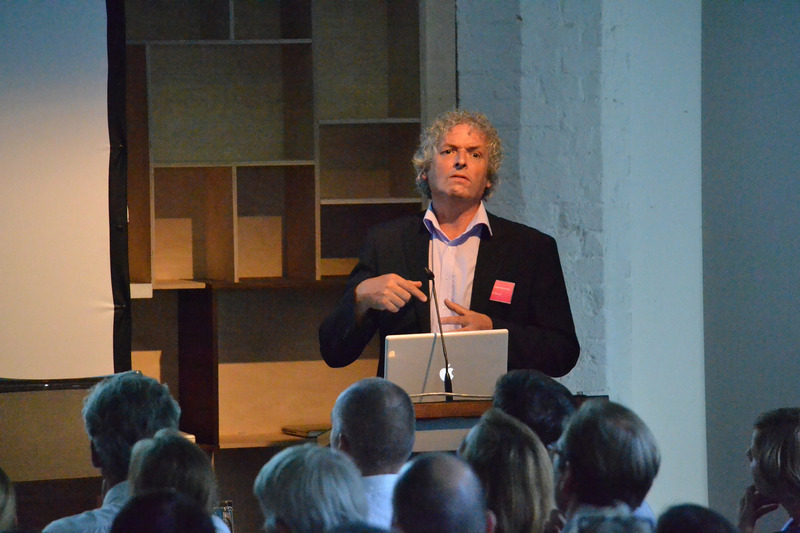 The design scheme addresses the future of the city of Hamburg as a high-performing and attractive 21st century metropolis. 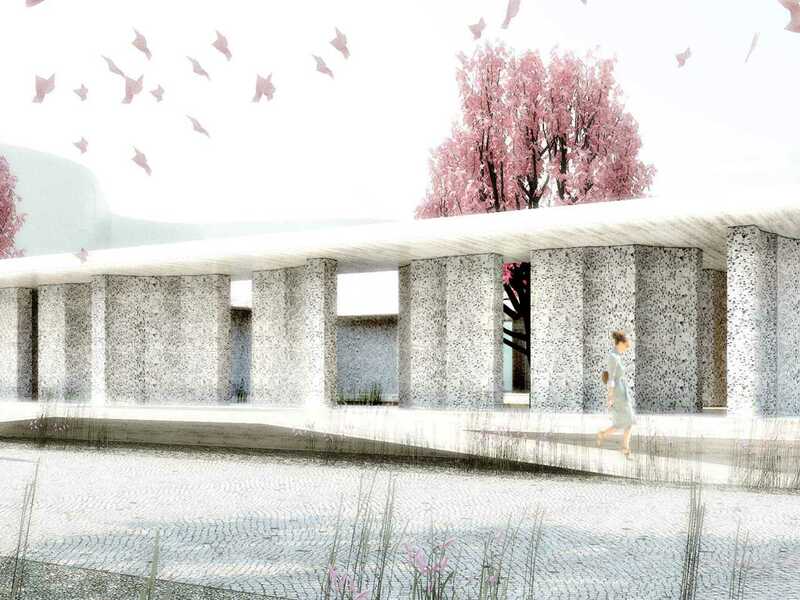 The brief for the Smart Material House required proposals for innovative building techniques and materials for a public housing project in a less developed neighborhood. 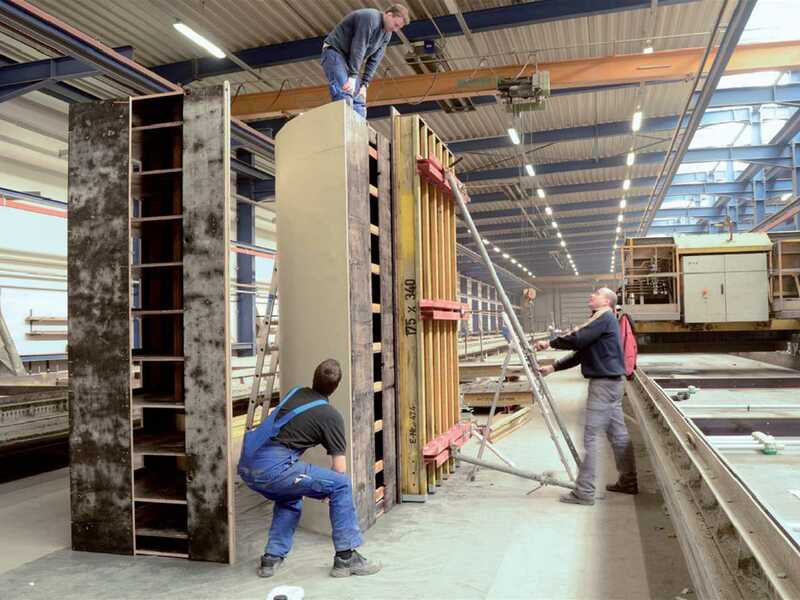 The units range in size between 90 and 225 square meters, and incorporate fast-growth fir decking slabs with pre-fabricated infra-lightweight concrete walls. 1:1 prototype of load-bearing infra-lightweight concrete wall – the Smart Material House and its innovative material concept is transferred into the design of a single-story information pavilion, which will serve as a public contact point in the area of Wilhelmsburg. Similar to the apartment building concept, it is planned to use infra-lightweight concrete walls as “Load-bearing thermal insulation” – the weight is reduced through the addition of recycled glass to a value of about 1,000 kilograms per cubic meter; floor decks are of glued-laminated timber panels. 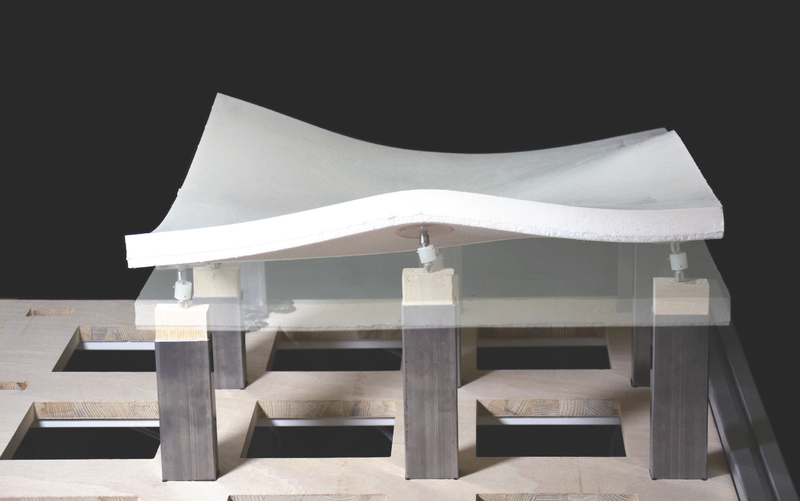 Smart Material Pavilion: inside yard. 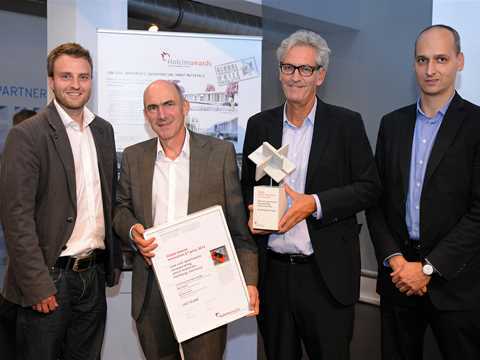 The project led by Barkow Leibinger Architects for low-cost apartments incorporating smart materials in Hamburg, Germany, is an outstanding achievement in terms of concrete technology, typology, and energy efficiency in the context of affordable housing. 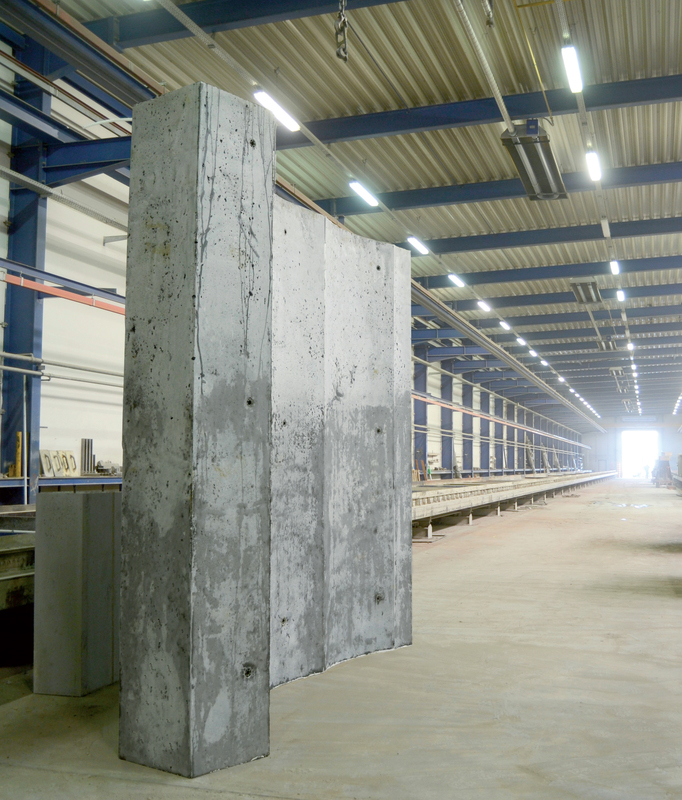 Firstly, the concrete technology makes it possible to cast wall elements with particular shapes in a prefabricated panel system. 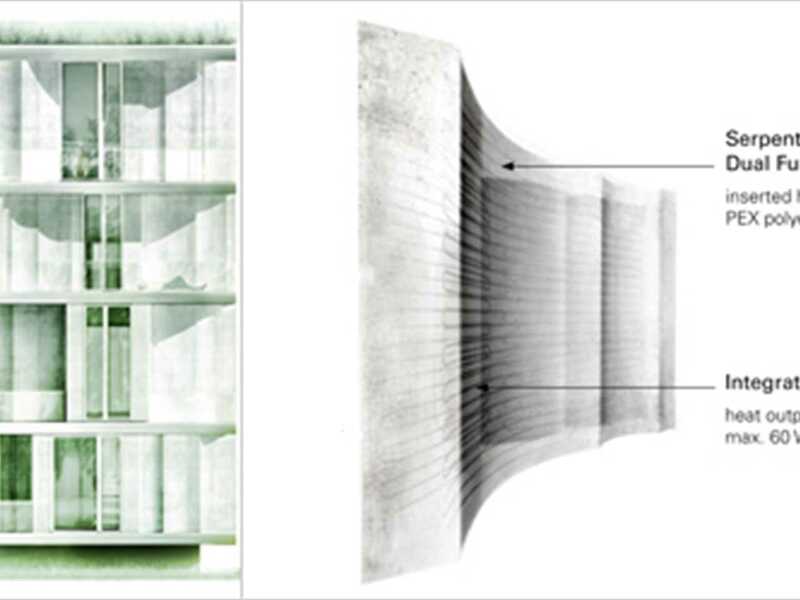 The design can be created with only two different wall prototypes, and yet achieves a surprising variability in the plastic expression of the walls. Depending on the orientation of the elements, the system can generate an astonishing array of variable ground plans. 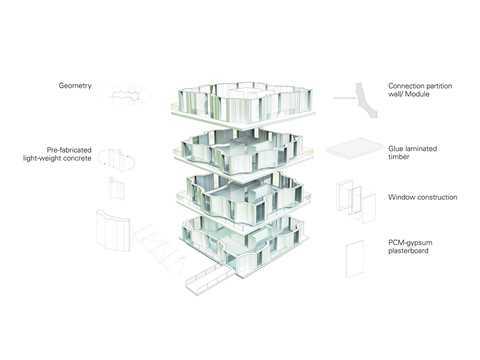 Since the walls only take vertical loads (horizontal loads are taken up by the central core), the system accommodates a high flexibility in the spatial organization of the ground plans. The concrete walls themselves are 50cm thick. The concrete is mixed with an aggregate of recycled glass, which reduces its density to less than 800 kilograms per cubic meter. 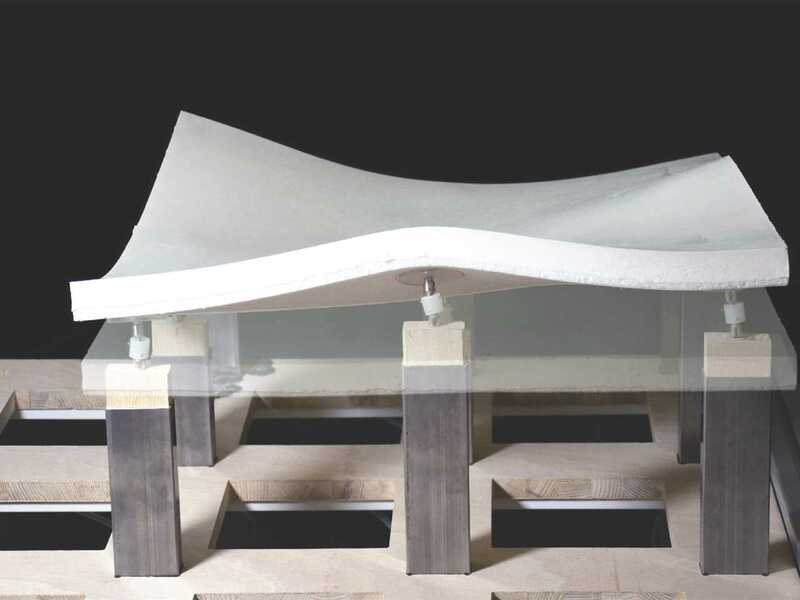 The weight of the concrete is further reduced by using glass fiber for reinforcement instead of steel. Snake-like tubes inserted in the outer portion of the concrete serve as solar collectors. Thanks to these measures, the concrete is thermally self-insulating, and does not require insulating materials to be applied to the exterior – its bare-faced concrete again, like in the heyday of modernism, but this time environmentally sound. 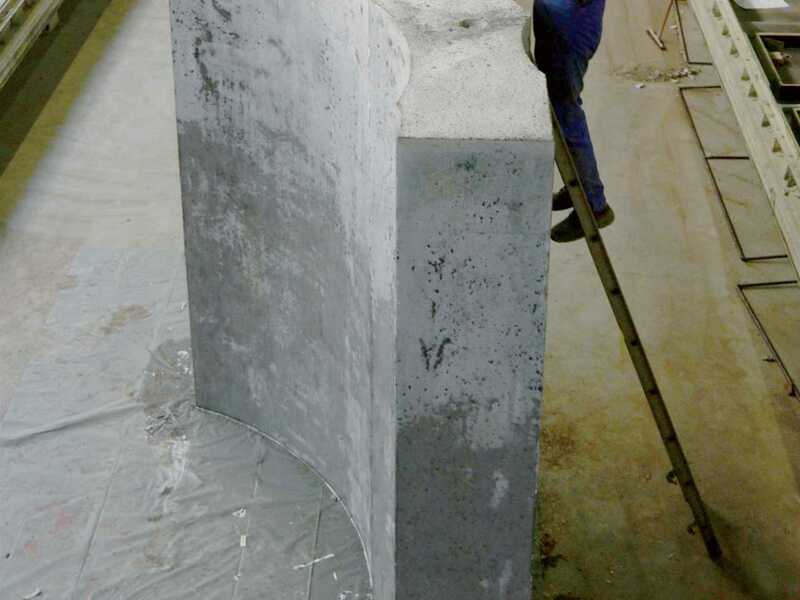 The outstanding merits of this innovative concrete production method are fourfold: First, it eliminates the need to use expensive and marginally-recyclable construction materials such as wood and steel sheet, while replacing the traditional materials for concrete formwork by wax. 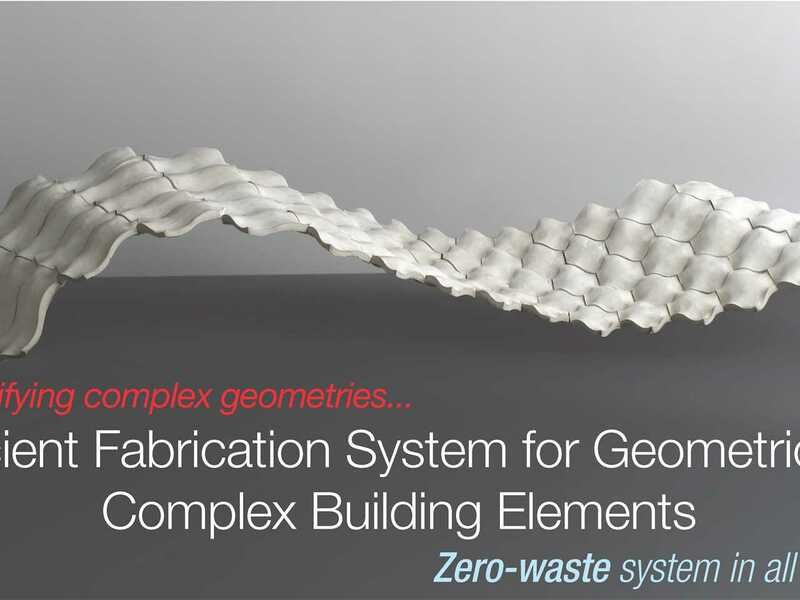 At the same time, it reduces formwork-related construction waste almost to zero. Second, it considerably cuts down the tremendous volume of manual labor necessary to produce highly complex concrete formwork because robots take-over the majority of the workload. 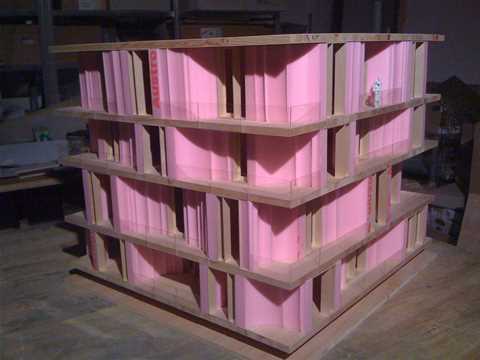 Third, the relatively low cost of this formwork technology is a prerequisite for the economical production of geometrically complex precast concrete elements in small series. Fourth, there are virtually no limits regarding the three-dimensional shape of precast concrete elements with a hitherto unimaginable degree of accuracy. 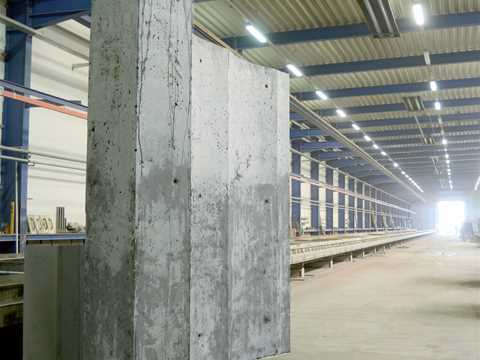 Overall, this visionary formwork technology for geometrically complex concrete elements is a real quantum leap combining the utmost computer-aided manufacture (CAM) technologies with the latest generation of robots that has the potential for revolutionizing the construction process enhancing sustainable construction. Hand-over of the Holcim Innovation 2nd prize for "Low-cost apartments incorporating smart materials", Hamburg, Germany: Members of the winning team for “Smart Material House” (l-r): Alexander Hückler and Mike Schlaich, Technische Universität Berlin with Frank Barkow and Heiko Krech, Barkow Leibinger Architects, Berlin. 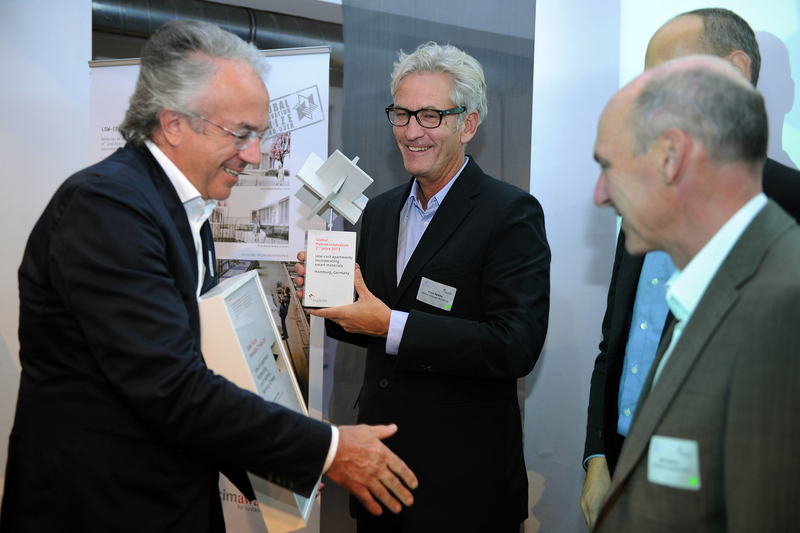 Hand-over of the Holcim Innovation 2nd prize for "Low-cost apartments incorporating smart materials", Hamburg, Germany: Introducing the commitment of Holcim in the area of sustainability to guests of the Holcim Innovation prize handover at IBA Hamburg: Roland Köhler, Member of the Executive Committee of Holcim responsible for Europe. 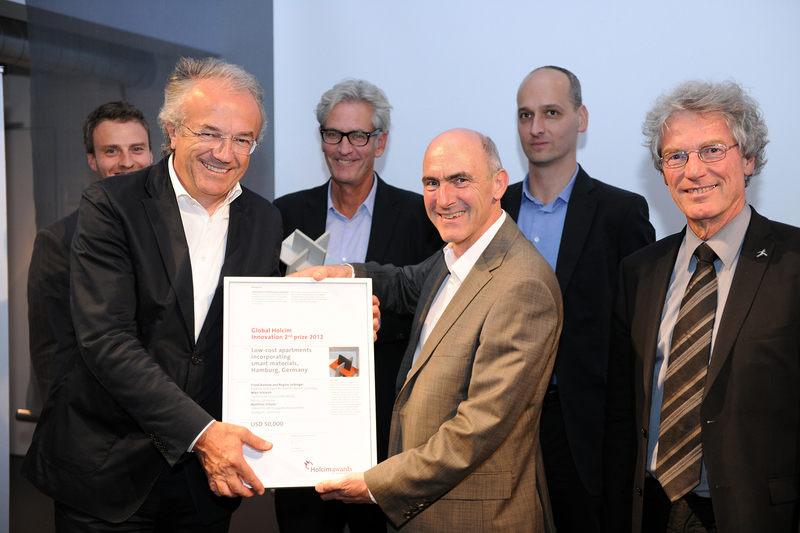 Hand-over of the Holcim Innovation 2nd prize for "Low-cost apartments incorporating smart materials", Hamburg, Germany: Congratulating prize winners (l-r): Werner Sobek, member of the Global Holcim Awards jury and Director of ILEK, University of Stuttgart with prize winners Frank Barkow, Barkow Leibinger Architects, Berlin and Mike Schlaich, TU Berlin. 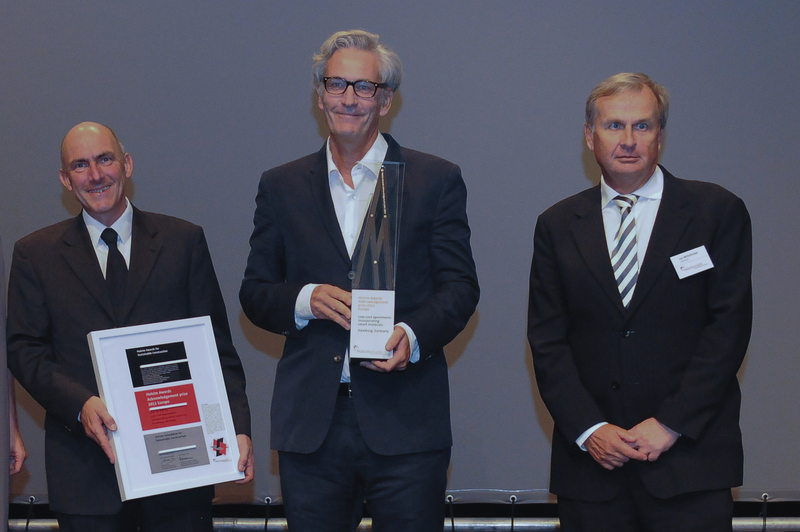 Presenting the Holcim Innovation 2nd prize for "Low-cost apartments incorporating smart materials", Hamburg, Germany (l-r, foreground): Werner Sobek, member of the Global Holcim Awards jury and Director of ILEK, University of Stuttgart congratulates prize-winner Mike Schlaich, TU Berlin with Uli Hellweg, CEO of IBA Hamburg (l-r, background): Alexander Hückler, Frank Barkow, and Heiko Krech. 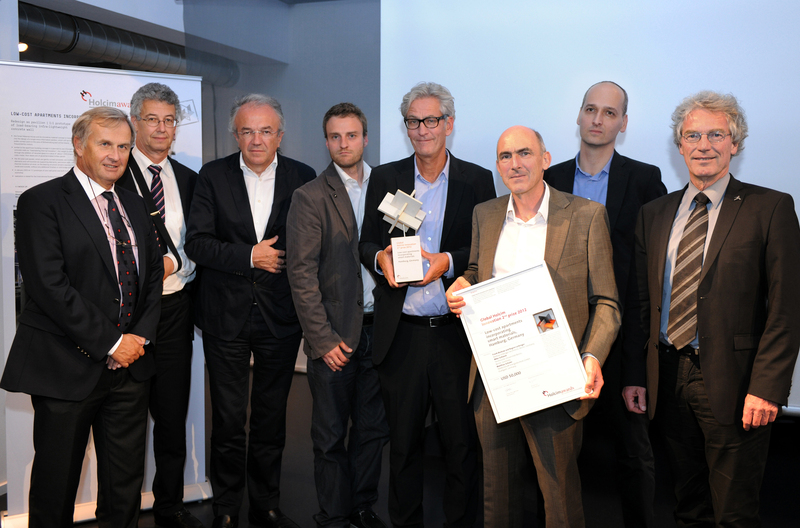 Hand-over of the Holcim Innovation 2nd prize for "Low-cost apartments incorporating smart materials", Hamburg, Germany: (l-r): Leo Mittelholzer, CEO, Holcim Germany; Roland Köhler, Holcim; Werner Sobek, jury member; with prize winners Alexander Hückler, Frank Barkow, Mike Schlaich and Heiko Krech with Uli Hellweg, CEO, IBA Hamburg. 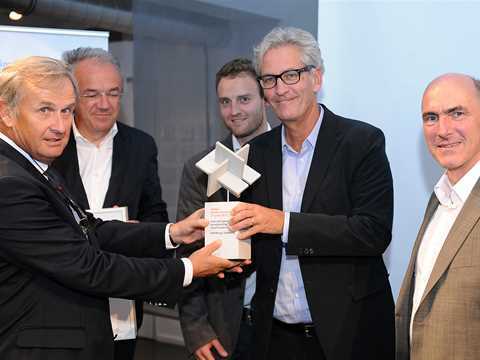 Hand-over of the Holcim Innovation 2nd prize for "Low-cost apartments incorporating smart materials", Hamburg, Germany: (l-r): Leo Mittelholzer, CEO, Holcim Germany and Werner Sobek, jury member, with prize winners Alexander Hückler, Frank Barkow, and Mike Schlaich. 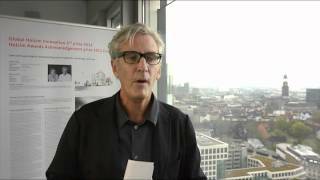 Hand-over of the Holcim Innovation 2nd prize for "Low-cost apartments incorporating smart materials", Hamburg, Germany: Prize winner Frank Barkow, Barkow Leibinger Architects, Berlin, Germany. Hand-over of the Holcim Innovation 2nd prize for "Low-cost apartments incorporating smart materials", Hamburg, Germany: Member of the winning team, Mike Schlaich, Technical University of Berlin (TU Berlin), Germany. 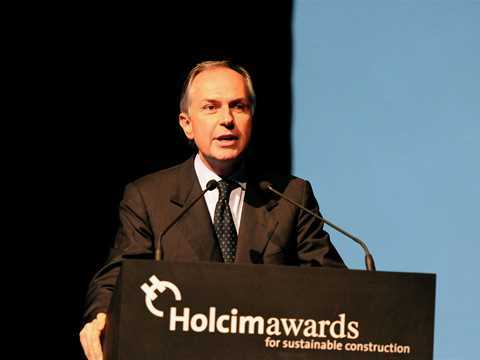 Leo Mittelholzer, CEO of Holcim Germany. 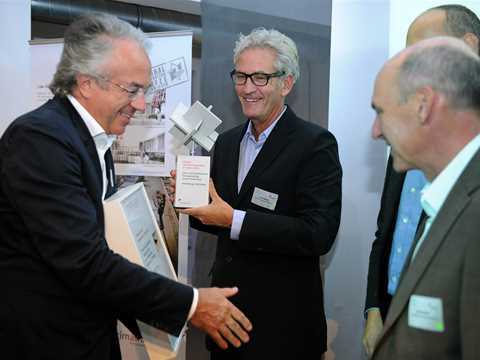 Hand-over of the Holcim Innovation 2nd prize for "Low-cost apartments incorporating smart materials", Hamburg, Germany: Discussing the winning project (l-r): Leo Mittelholzer, CEO of Holcim Germany with Frank Barkow, Barkow Leibinger Architects, Berlin, Germany. 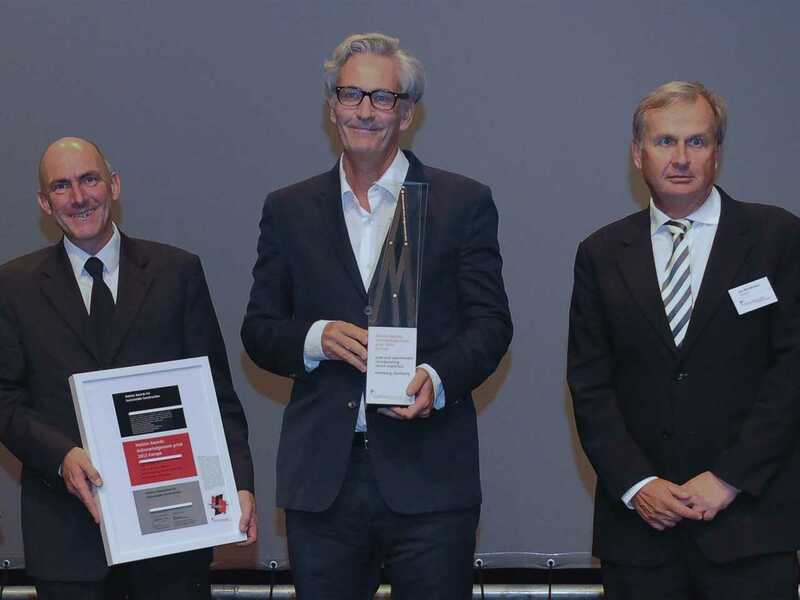 Hand-over of the Holcim Innovation 2nd prize for "Low-cost apartments incorporating smart materials", Hamburg, Germany: Werner Sobek, member of the Global Holcim Awards jury and Director of the Institute for Lightweight Structures and Conceptual Design (ILEK) at the University of Stuttgart. Hand-over of the Holcim Innovation 2nd prize for "Low-cost apartments incorporating smart materials", Hamburg, Germany: Roland Köhler speaking at the Global Holcim Innovation 2nd prize handover to “Low-cost apartments incorporating smart materials”, in Hamburg, Germany. 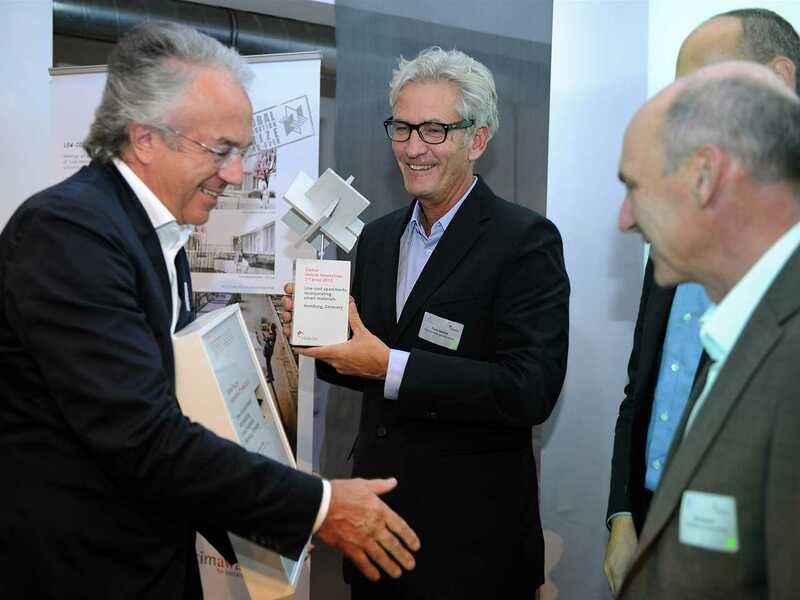 Hand-over of the Holcim Innovation 2nd prize for "Low-cost apartments incorporating smart materials", Hamburg, Germany at the IBA international building exhibition in Hamburg: invited guests with Marius Leutenegger, Moderator. 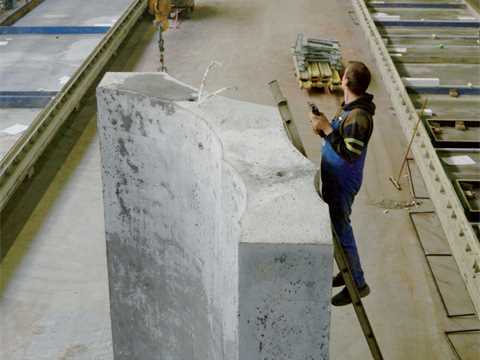 The significant potential for the innovative use of concrete as a building material is currently showcased at the International Building Exhibition (Internationale Bauausstellung) IBA in Hamburg. A team from Barkow Leibinger Architects developed a Smart Material House for the IBA Hamburg which was presented with a Global Holcim Innovation prize. The winning project in the newly-created “Innovation” category was selected from more than 6,000 entries in 126 countries that took part in the 3rd International Holcim Awards competition. 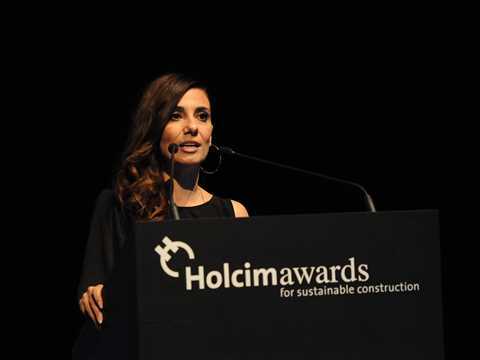 The Holcim Innovation prize honors projects that represent the leading edge of materials innovation and new approaches to building technology. 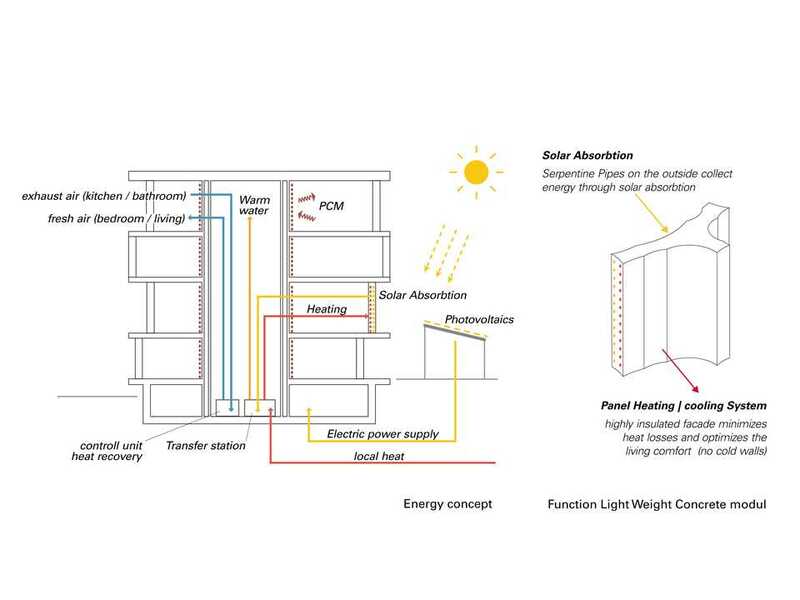 Frank Barkow and Regine Leibinger of Barkow Leibinger Architects in Berlin, along with Mike Schlaich, Technical University of Berlin (TU Berlin), and Matthias Schuler, Transsolar Energietechnik in Stuttgart designed a Smart Material House that addresses the provision of low-cost housing in the City of Hamburg – that meets the needs for economic and ecological performance, as well as architectural aesthetics and social equity. 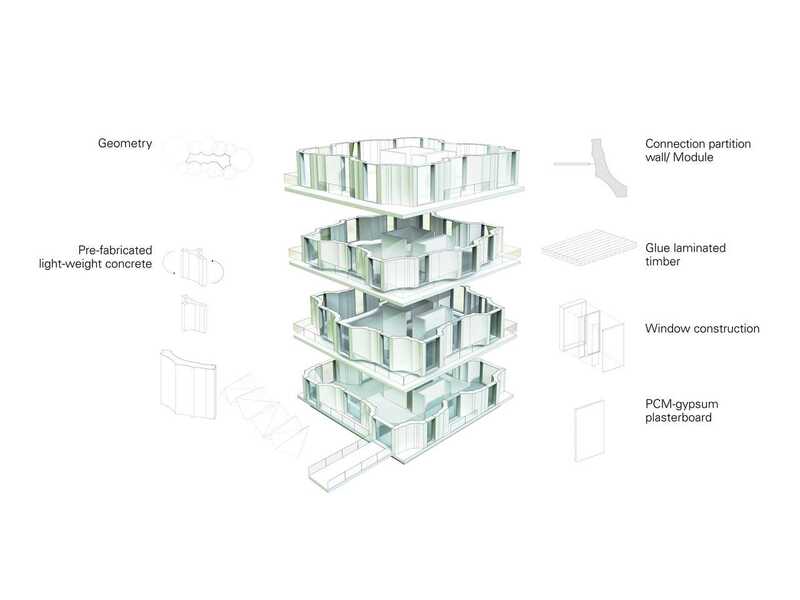 Adroit design techniques are combined with smart materials including infra-lightweight concrete and glued laminated timber (glulam) are stacked like a “house of cards” to create multi-level apartments of 90-225 m2. 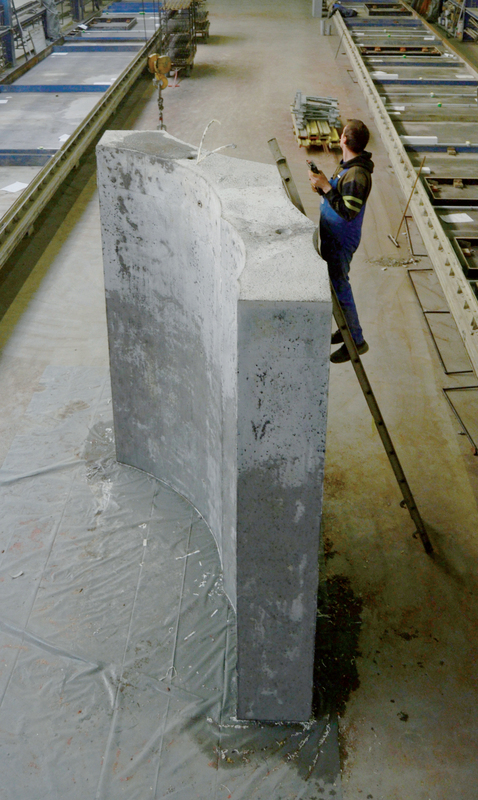 The pre-fabricated concrete used weighs only one third of conventional concrete: yet it delivers additional benefits to the building. 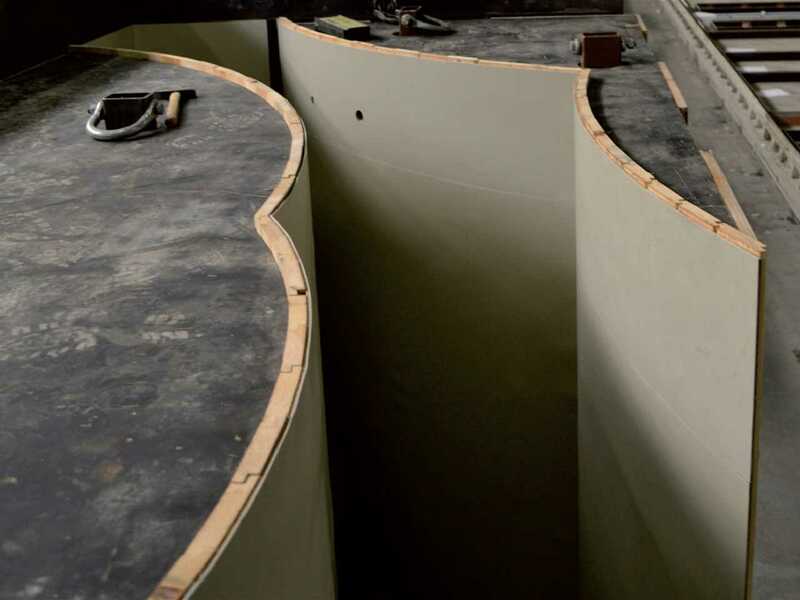 The massive curved, precast elements are load-bearing walls, delineate space, provide thermal insulation, and also encase parts of the heating and cooling system. 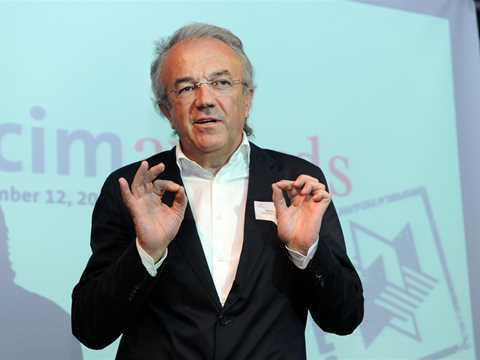 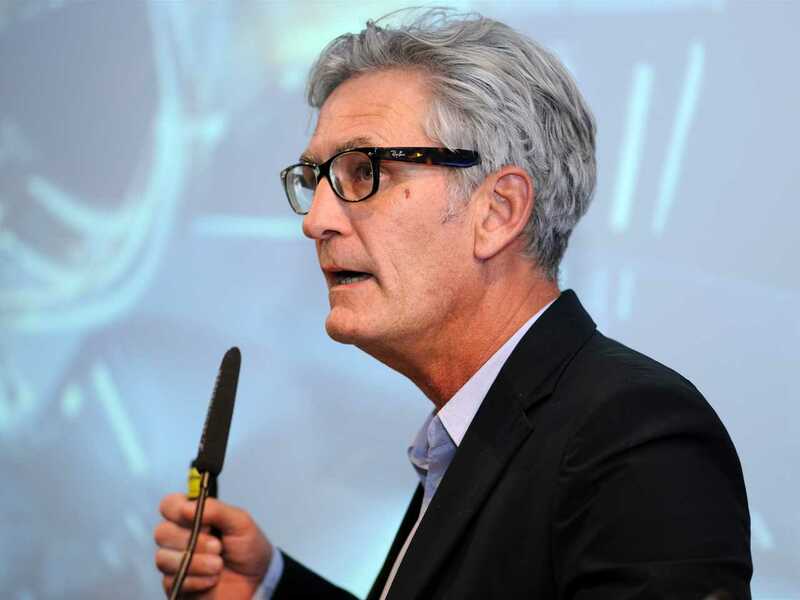 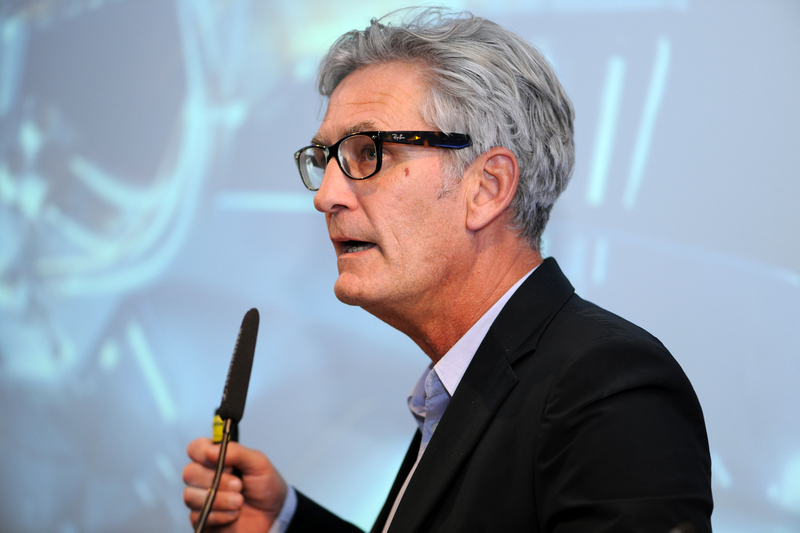 Chairman of the Global Holcim Innovation prize jury, renowned architect and Professor at the Swiss Federal Institute of Technology (EPFL) in Lausanne, Harry Gugger, considers the technology to be a quantum leap. 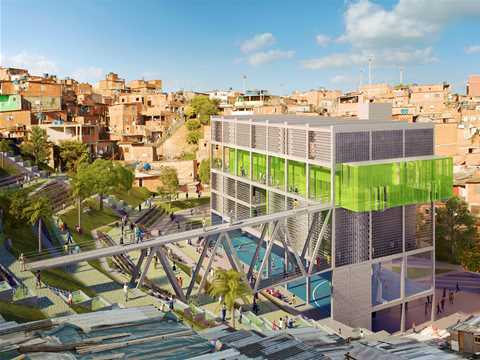 “The project team has developed a simple, monolithic structure, while pursuing a formally ambitious concept for low-cost housing, that has created an aesthetically-pleasing environment with an architectural quality in terms of space, form, light, and ambiance,” he said. 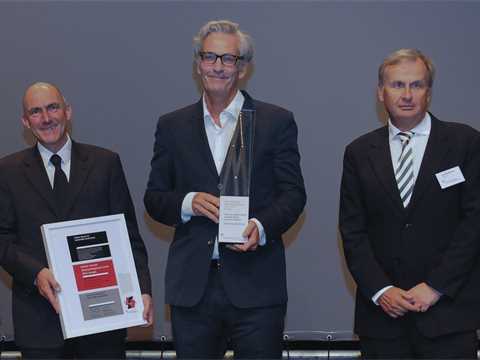 The prize of USD 50,000 was presented at the IBA Hamburg by Werner Sobek. 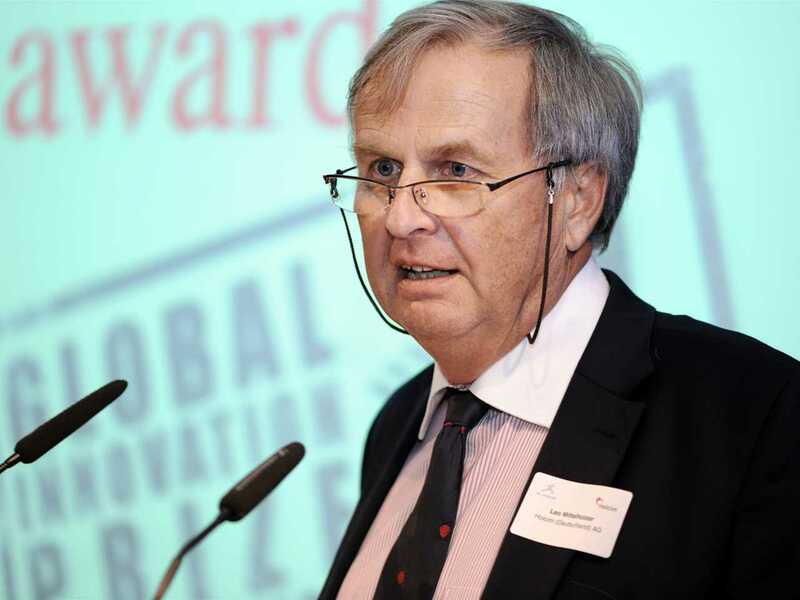 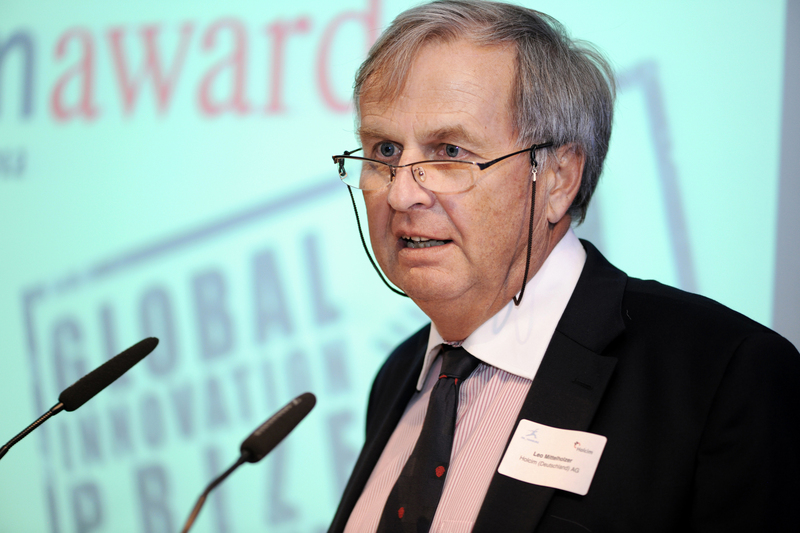 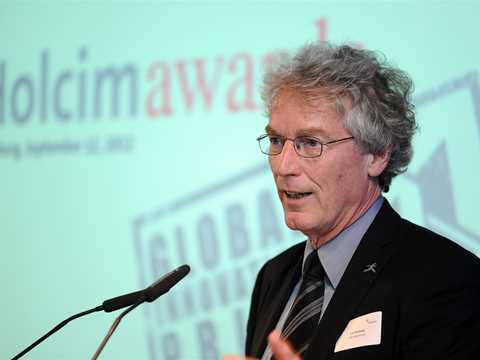 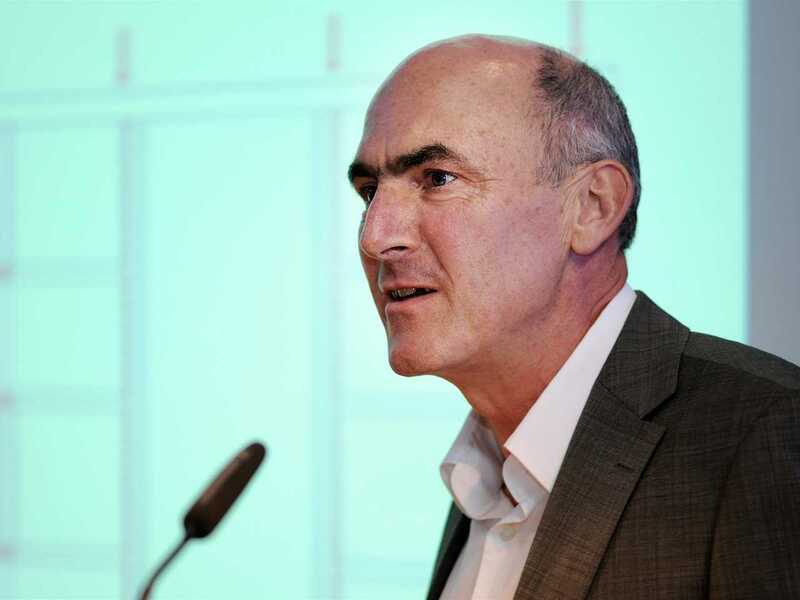 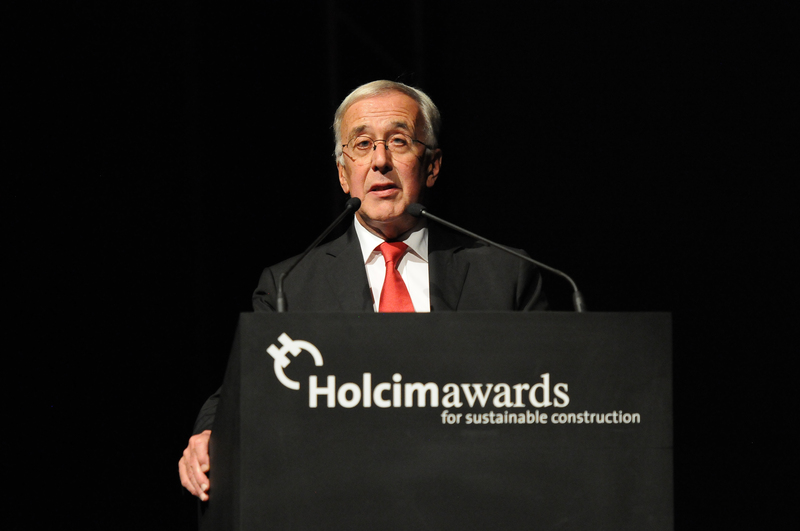 The eminent civil engineer and Director of the Institute for Lightweight Structures and Conceptual Design (ILEK) at the University of Stuttgart, was also a member of the Global Holcim Awards jury. 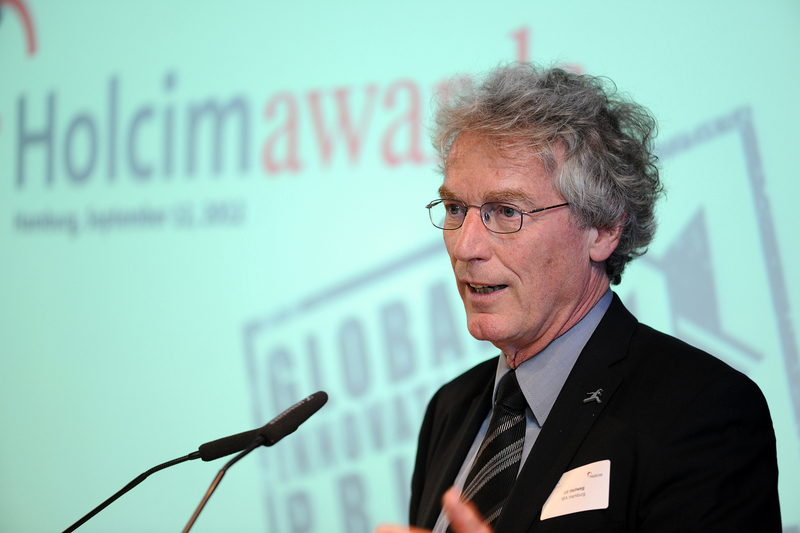 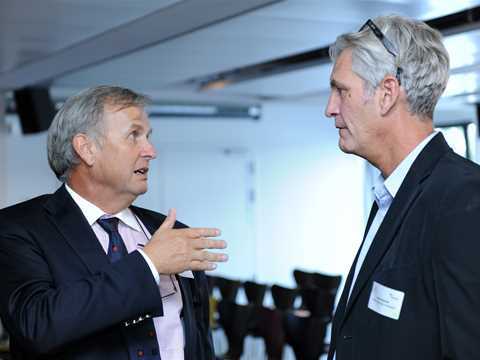 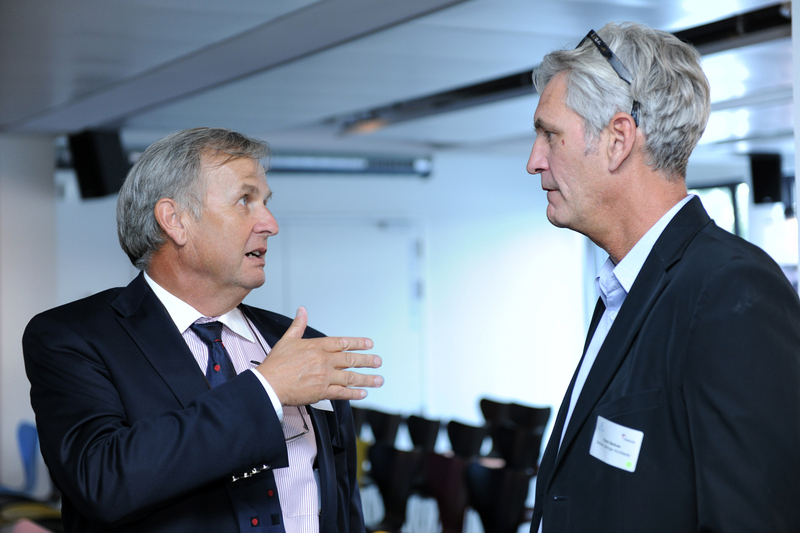 Guests were welcomed by Uli Hellweg, CEO of IBA Hamburg. 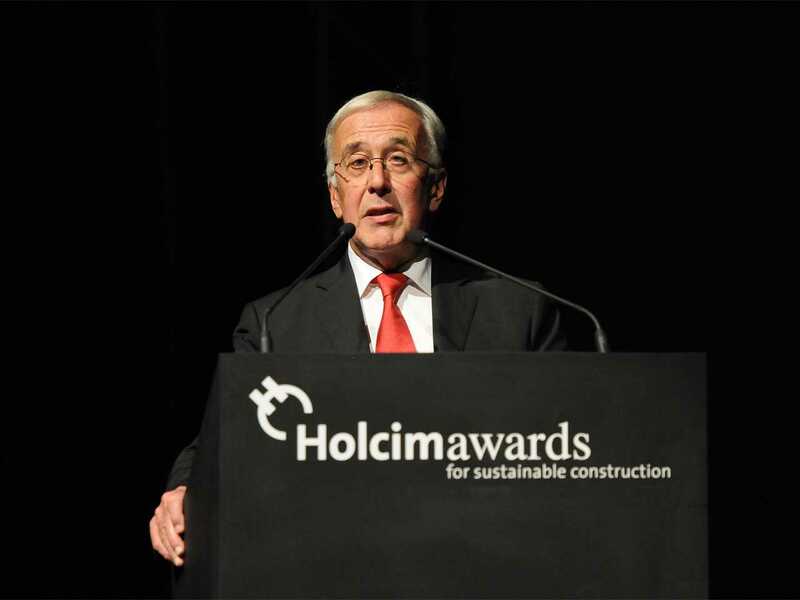 Roland Köhler, Member of the Executive Committee of Holcim responsible for Europe, and Leo Mittelholzer, CEO of Holcim Germany focused their speeches on the commitment of Holcim in the area of sustainability. 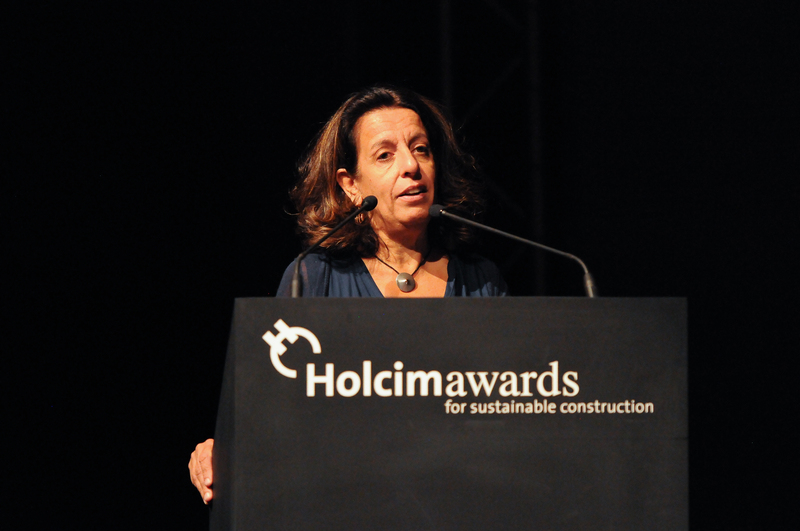 “As a producer of construction materials we are at the beginning of a value creation chain. Our intention is to build awareness of sustainable construction amongst professionals and the public and to strengthen its significance in research and development, and in practice,” said Leo Mittelholzer. The presentation of the first Innovation prizes is a highlight of the 3rd Holcim Awards competition. 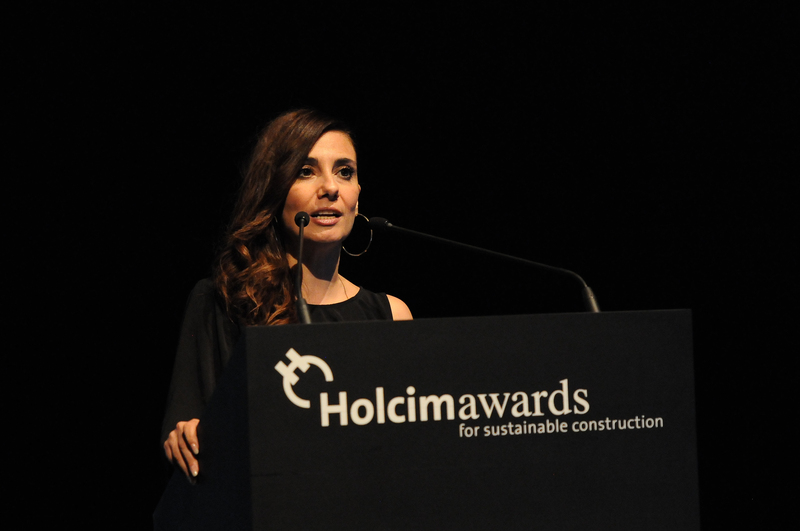 The competition seeks innovative, future-oriented and tangible construction projects to promote sustainable responses to the technological, environmental, socioeconomic and cultural issues affecting building and construction on a local, regional and global level. 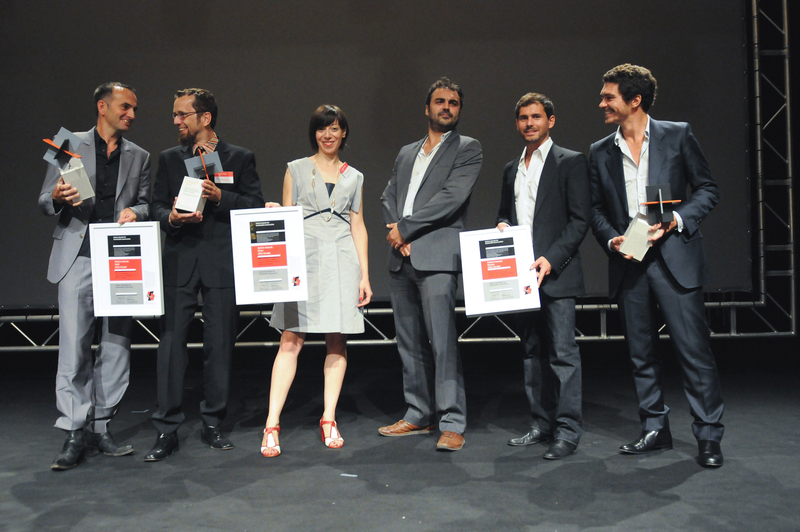 The competition takes place first across five global regions, with prize-winners progressing to a global phase. All 53 projects that were awarded a prize in the regional phase of the competition in 2011 were eligible to compete for global Holcim Innovation prizes. 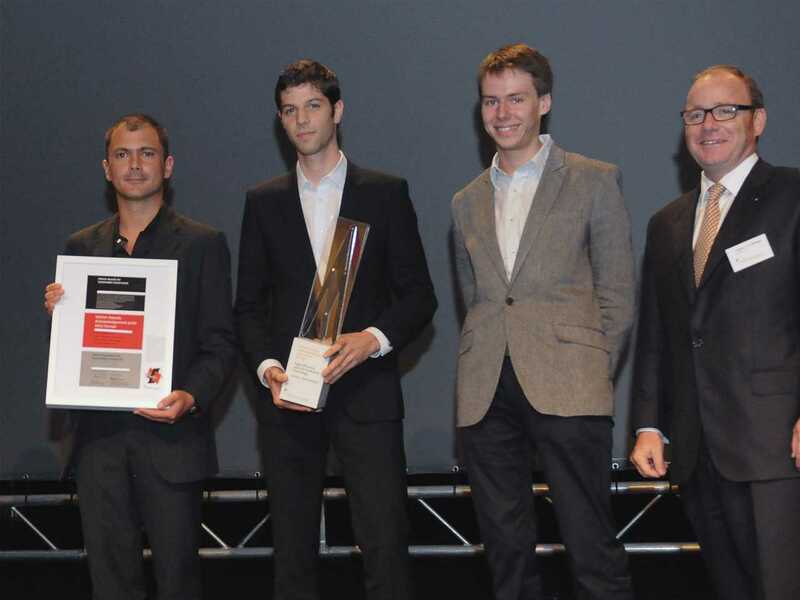 Further Holcim Innovation prizes were presented to the High-efficiency concrete formwork technology project by Fabio Gramazio and Matthias Kohler, Professors of Architecture and Digital Fabrication at the Swiss Federal Institute of Technology (ETH Zurich), and to a group of students of the AA School of Architecture in London, for their Cast on cast: efficient fabrication system for geometrically complex building elements. 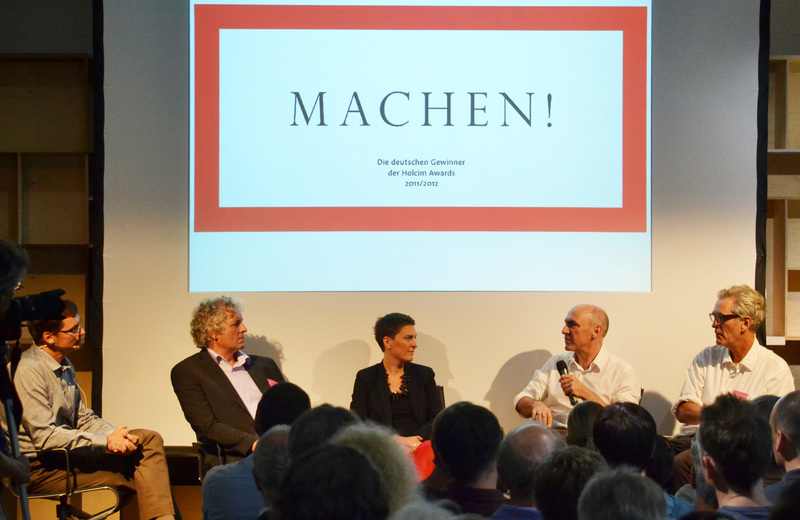 “Heating with concrete, cooling with clay” (l-r): moderator Andreas Ruby with speakers Martin Rauch, Anna Heringer, Mike Schlaich and Frank Barkow. 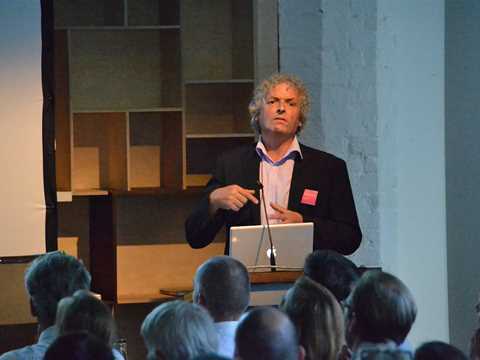 Martin Rauch, Baukunst, Austria emphasized the use of nearby resources including the workforce and earth as the primary construction material for the Training center for sustainable construction, Morocco. 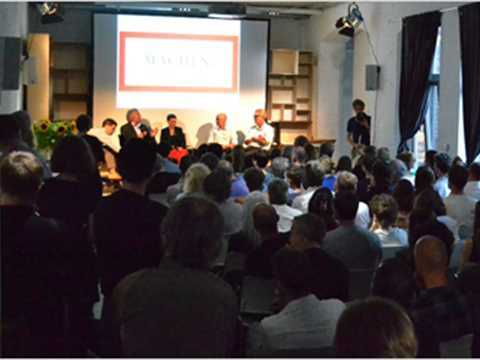 At the discussion evening, Aedes Architekturforum, Berlin – August 3, 2012: Anna Heringer, architect, Germany explained the importance of demonstrating a range of sustainable construction techniques within reach of the community in Marrakesh. At the discussion evening, Aedes Architekturforum, Berlin – August 3, 2012: Mike Schlaich, Technische Universität Berlin, Institut für Bauingenieurwesen, Fachgebiet Entwerfen und Konstruieren - Massivbau, Germany introduces the “Smart Materials House”, Hamburg, Germany. Some 130 people attended “Heating with concrete, cooling with clay” at Aedes Architekturforum in Berlin, demonstrating a keen interest in the topic of sustainable construction and the Holcim Awards winning projects discussed. 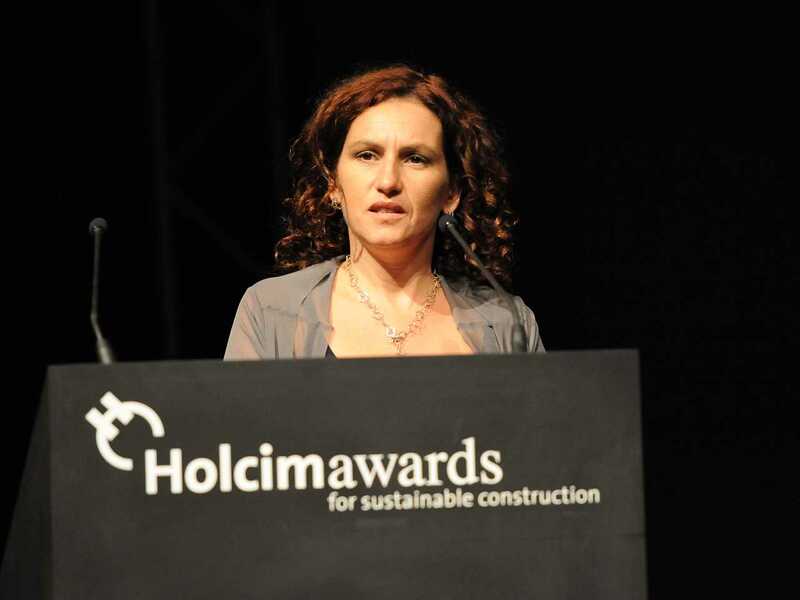 “Heating with concrete, cooling with clay” – the provocative title of the second discussion round with German winners of the Holcim Awards again attracted more people than the lecture theatre could accommodate at the Aedes Architekturforum in Berlin. 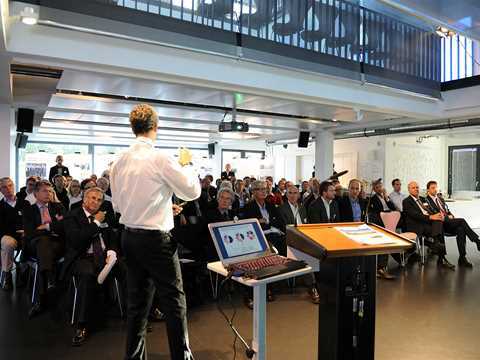 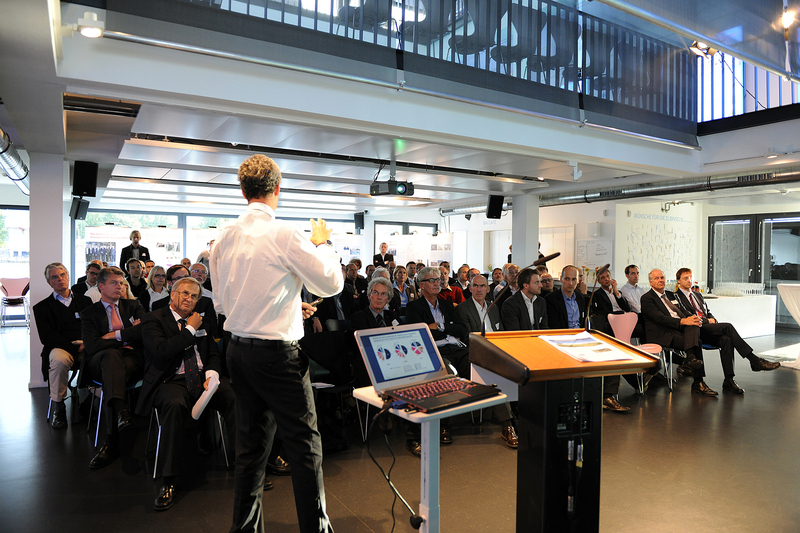 Some 130 people including a group of guests from Holcim Southern Germany showed interest in learning more about the Smart Material House in Hamburg and an educational center for sustainability in Marrakesh, Morocco. 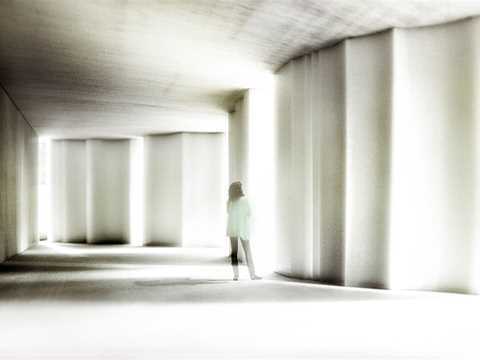 The exhibition at the ANCB Metropolitan Laboratory will continue until August 30, 2012. 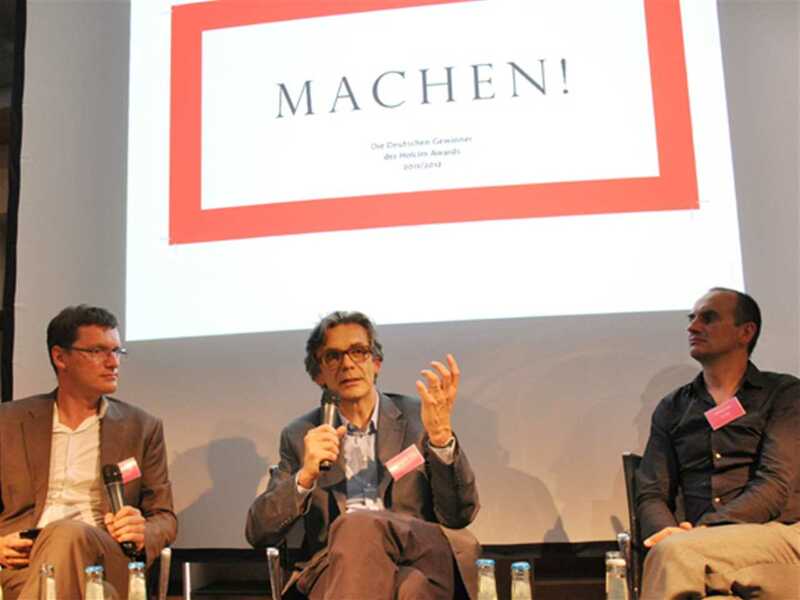 Matthias Sauerbruch (Sauerbruch Hutton) during the moderated discussion. 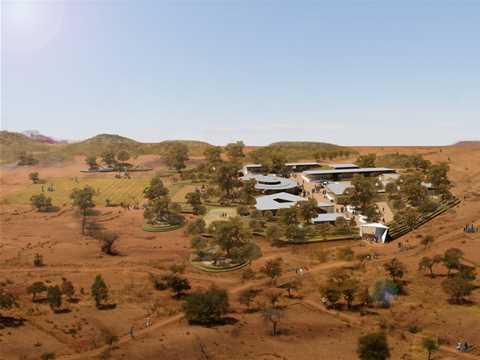 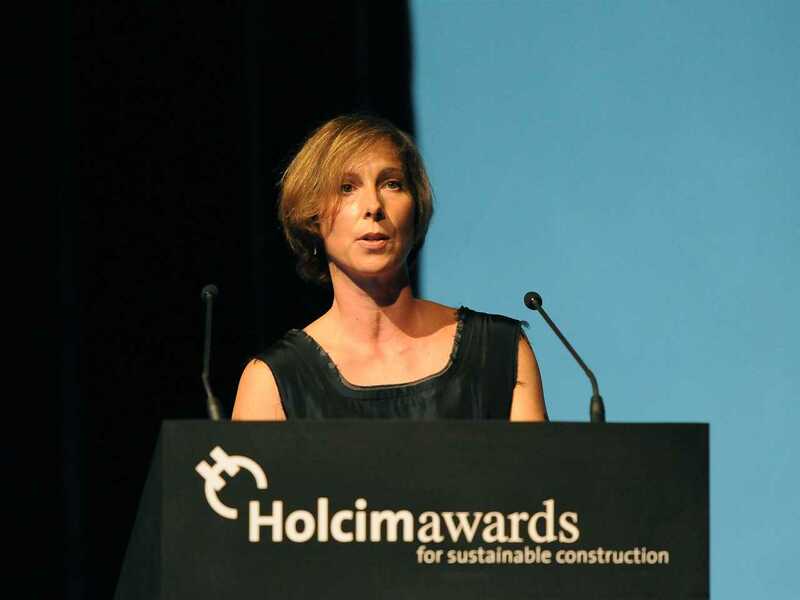 The firm’s project won a Holcim Awards Acknowledgement and aims to achieve carbon negative buildings through the inclusion of complimentary initiatives, materials and infrastructure to reduce carbon footprints. 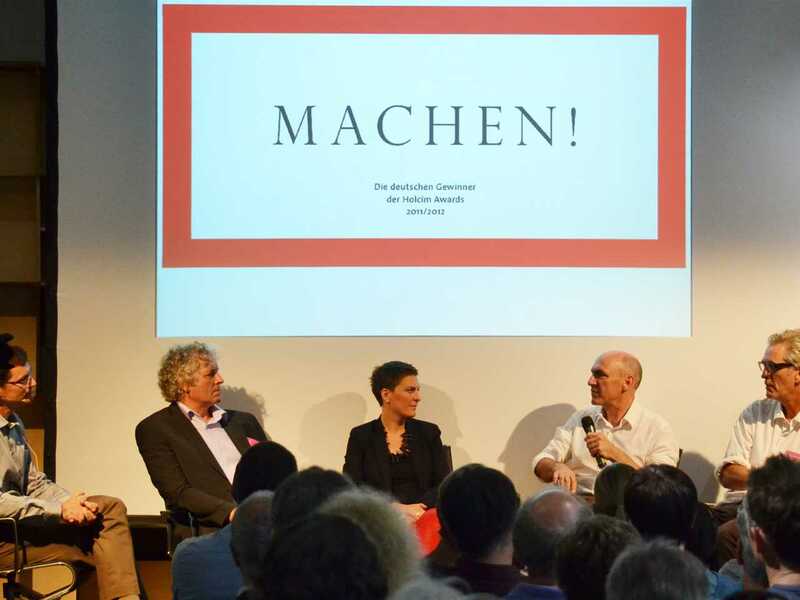 Moderated discussion at the opening of the “MACHEN!” exhibition on the topic “Savoir Vivre: How to use the city for (re) building so that it allows for different lifestyles” (l-r): Andreas Ruby, exhibition curator, Ruby ; Ruby Press; Tim Edler, realities:united; Matthias Sauerbruch, Sauerbruch Hutton. The exhibition “MACHEN!” (to make) at the AEDES Network Campus follows the development process of six projects including the Smart Material House – Low-cost apartments incorporating smart materials. 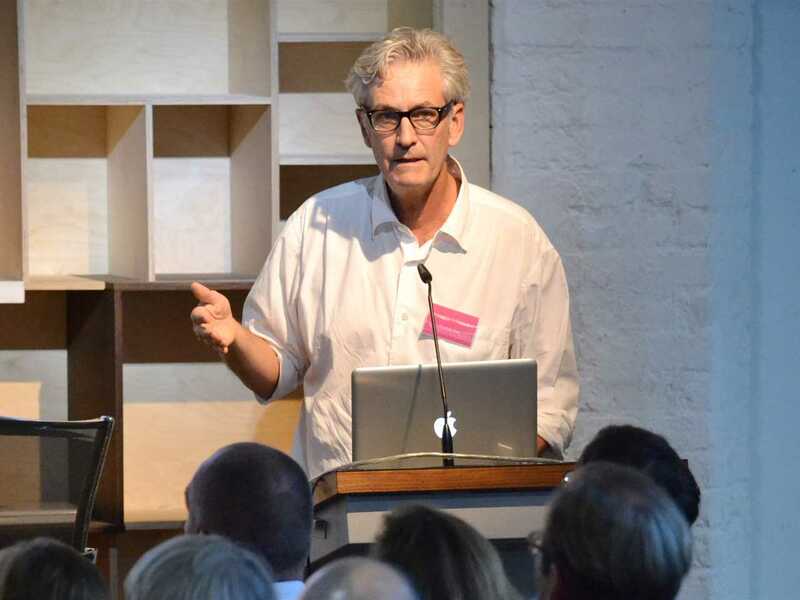 All six projects are examples of a new, reflective approach to the topic: for a building to be truly sustainable, architects must use their own creative and conceptual skills – where technology is employed not for its own sake, but as a means to a well-executive series of objectives. Secondary school with passive ventilation system, Gando, Burkina Faso: Buffer zone. 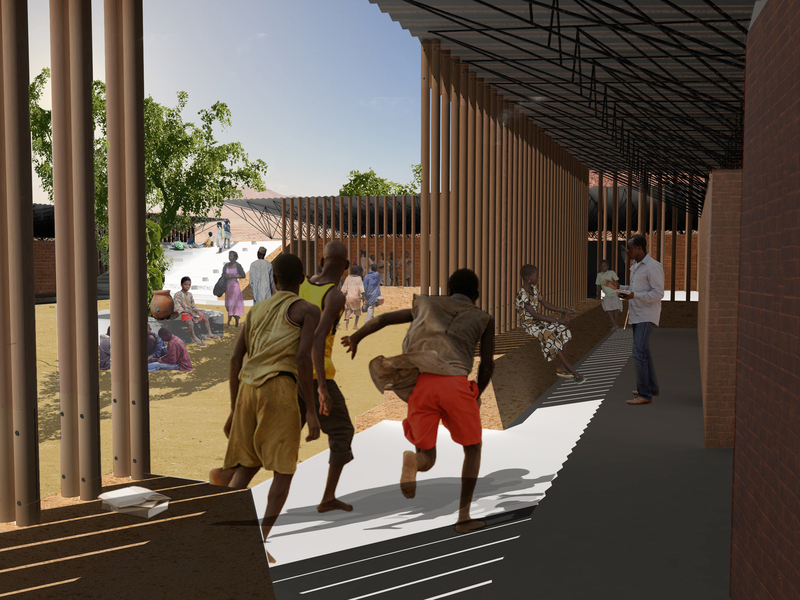 Project entry 2011 - Secondary school with passive ventilation system, Gando, Burkina Faso: Aerial view. 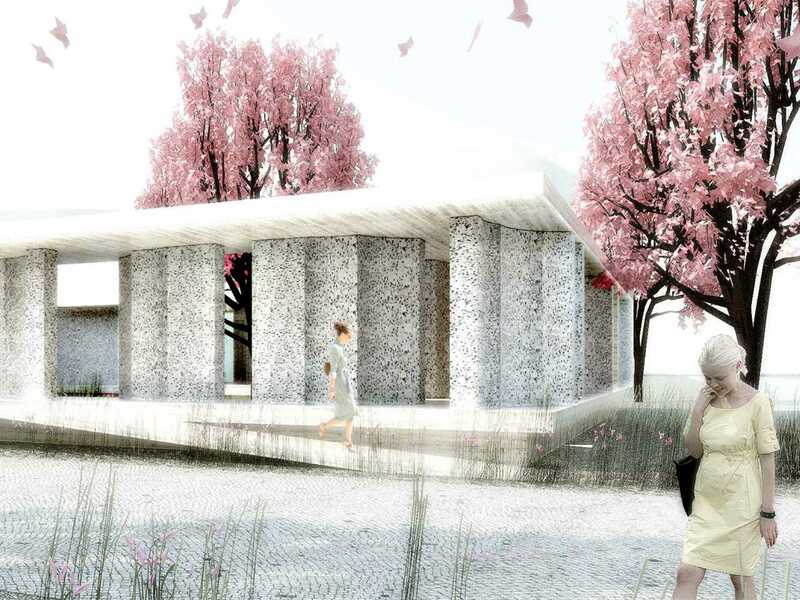 Landscape and music school developed as one building. 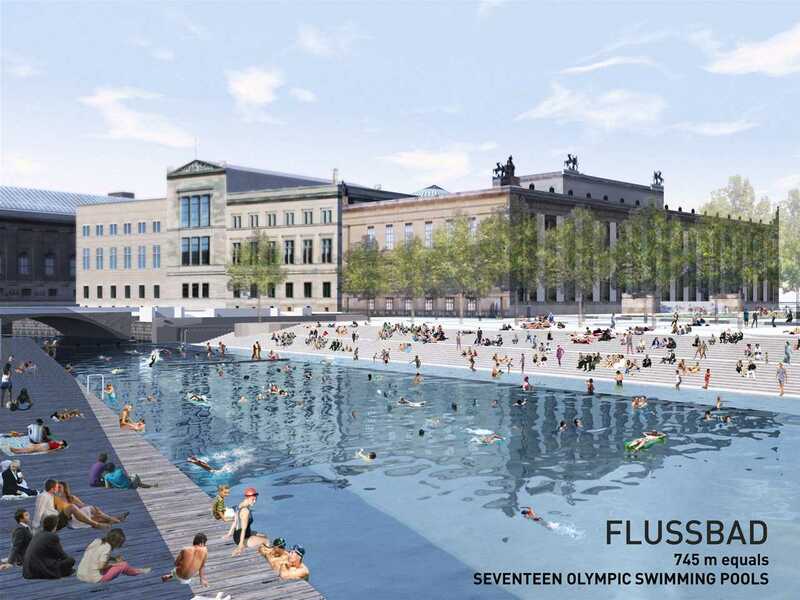 Panorama Flussbad - left side. 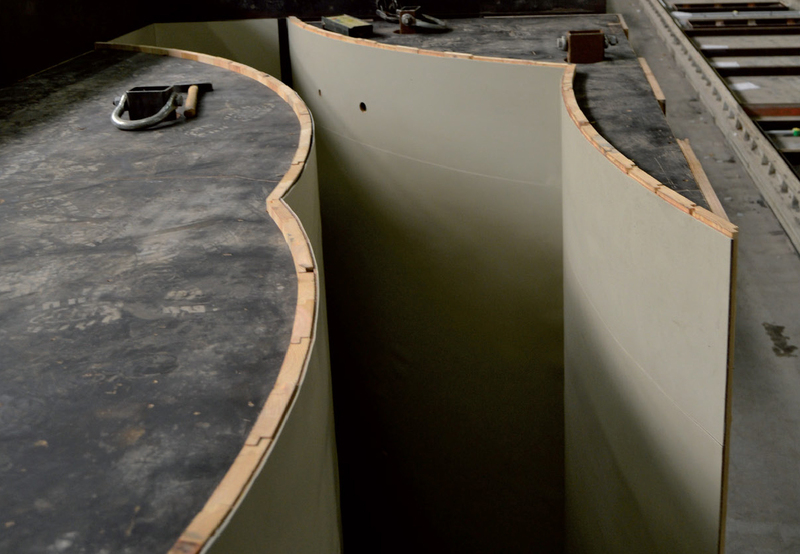 Step 1: adjustable mold actuation. 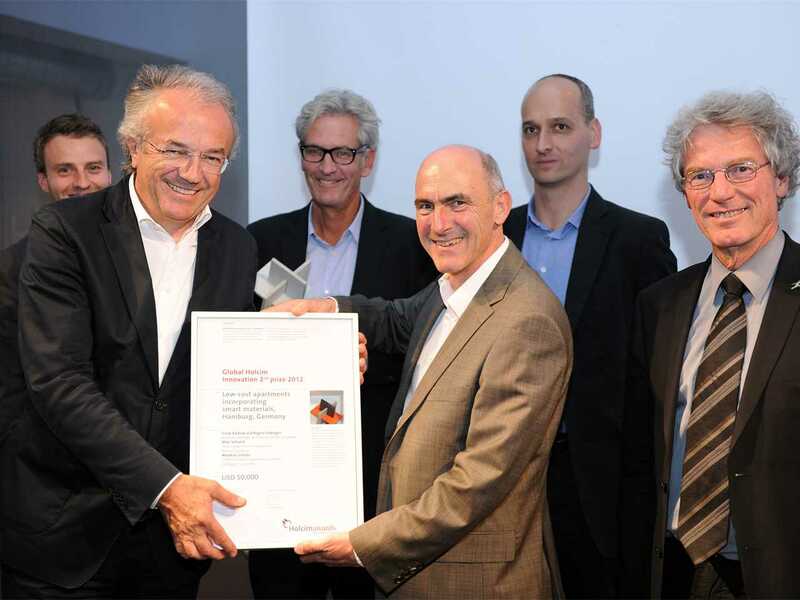 The Holcim Innovation 2nd prize was presented to a collaborative project by German Barkow Leibinger Architects, Schlaich Bergermann und Partner, Technische Hochschule Berlin (TU Berlin), and Transsolar Energietechnik. 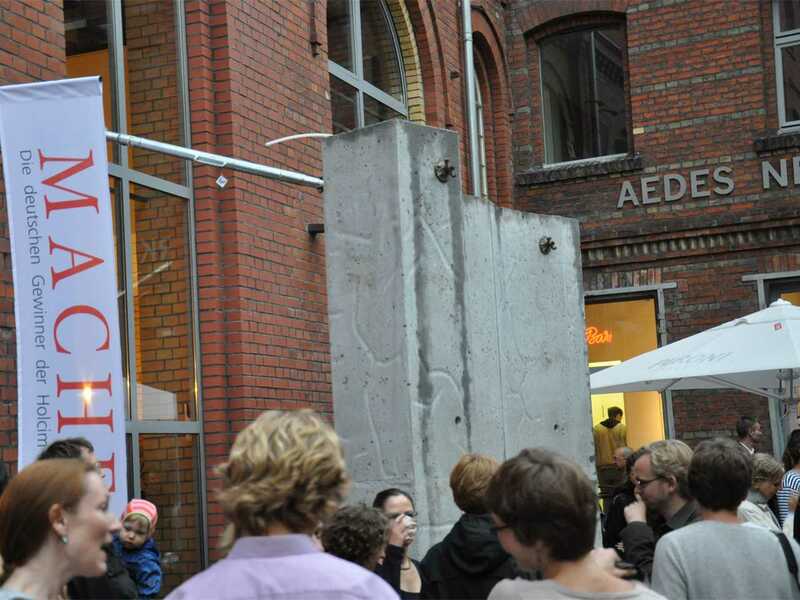 Their low-cost apartments project in Hamburg uses innovative techniques and materials including prefabricated lightweight-concrete elements with recycled foamed glass as an internal aggregate. The monolithic structures are simple and lightweight, but remain formally complex and ambitious in delivering aesthetic impact. 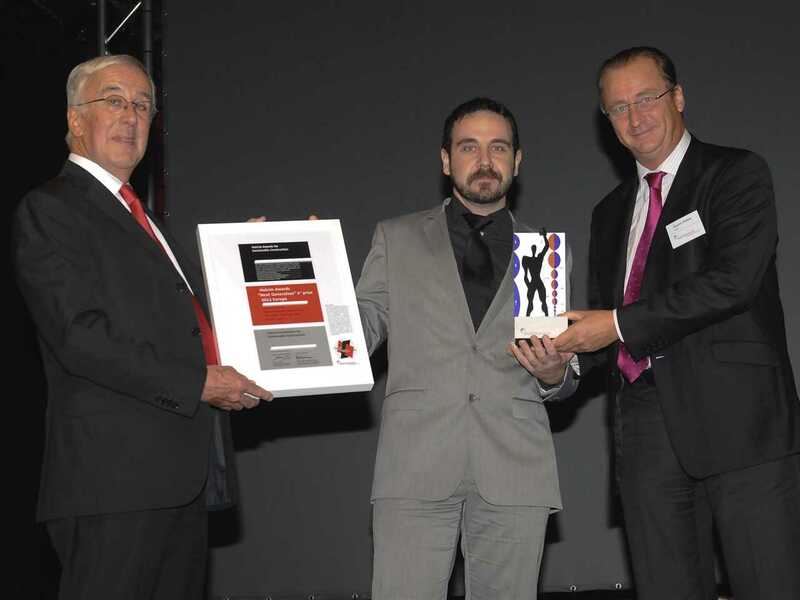 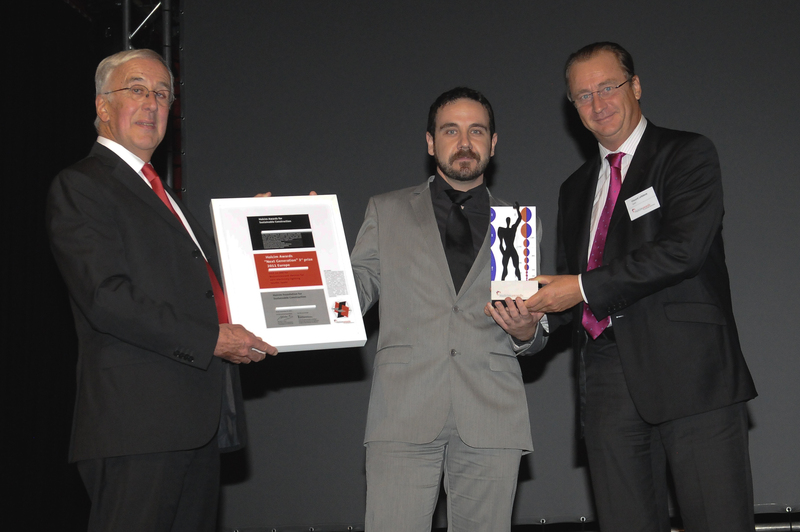 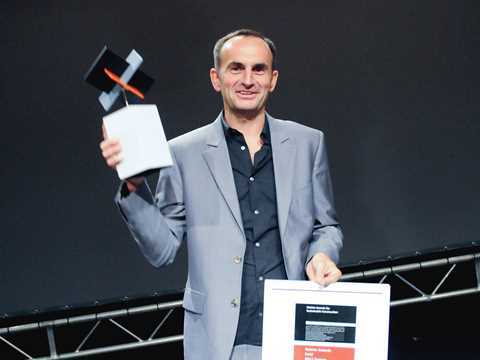 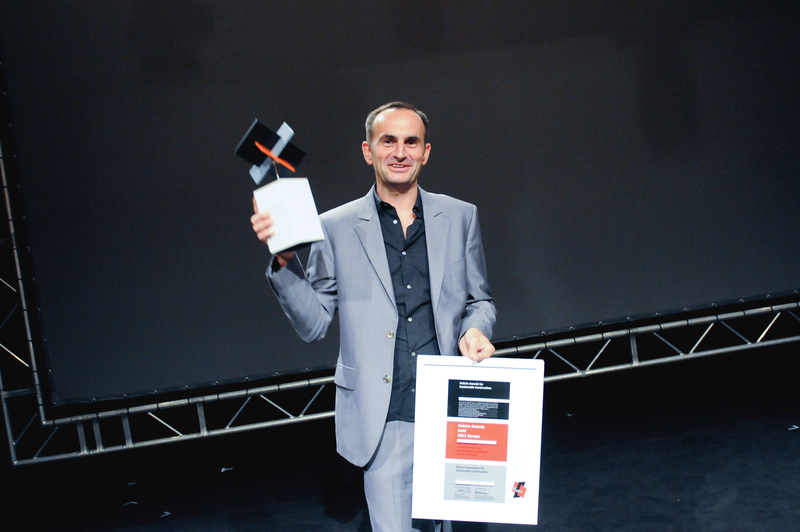 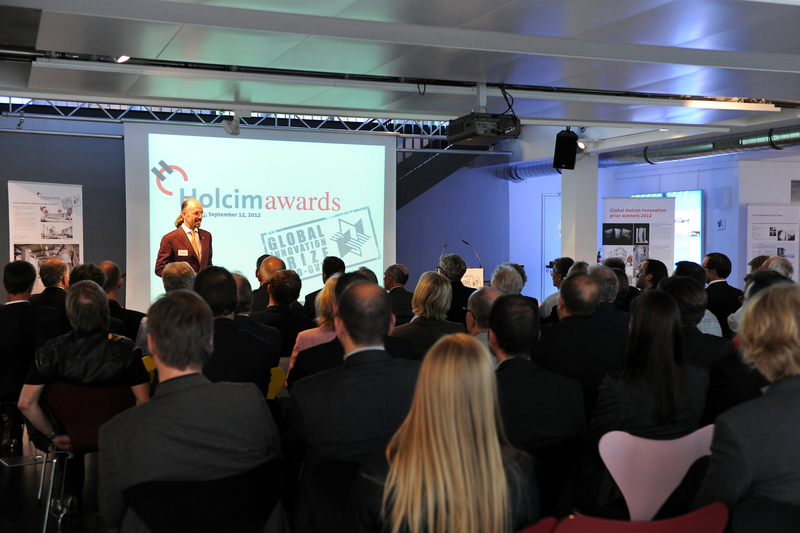 Winner of the Holcim Awards Gold 2011 Europe, Tim Edler of realities united, Germany. 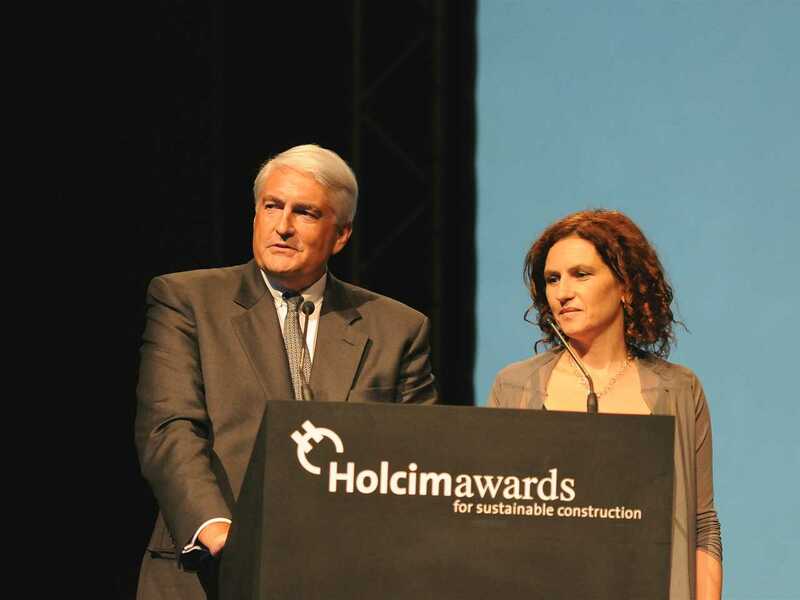 Holcim Awards 2011 Europe ceremony - September 15, 2011 - Milan, Italy Holcim Awards Silver 2011 Europe winners (l-r) Carlos Arroyo and Vanessa Cerezo of Carlos Arroyo Arquitectos, Spain. Winners of the Holcim Awards Bronze 2011 Europe at the regional Holcim Awards prize handover in Milan, Italy (l-r): Tanguy Vermet, Off Architecture, Paris, France; Samuel Nageotte, Samuel Nageotte Architecture, Paris, France; and Philippe Rizzotti, Philippe Rizzotti Architects, Paris, France. 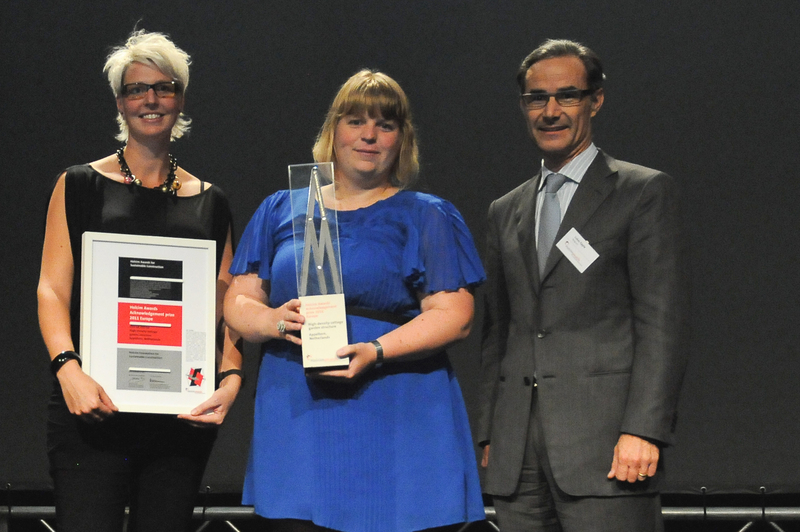 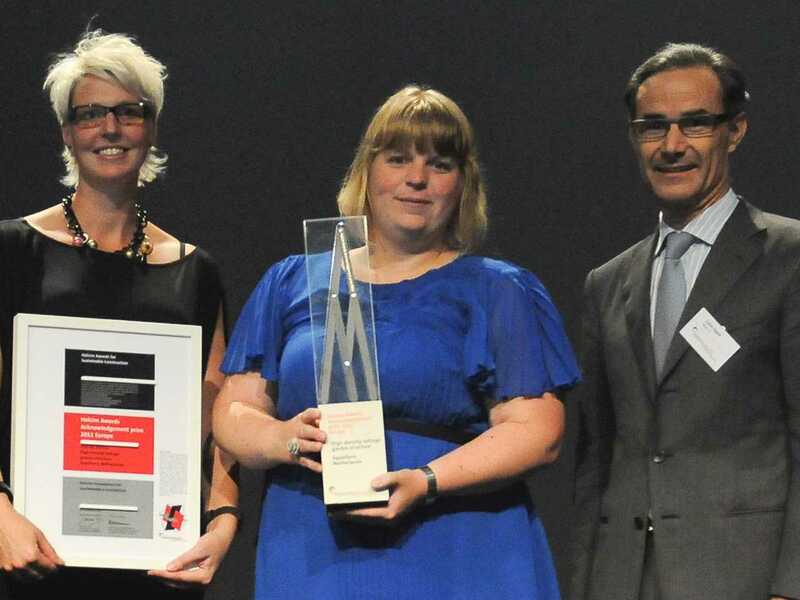 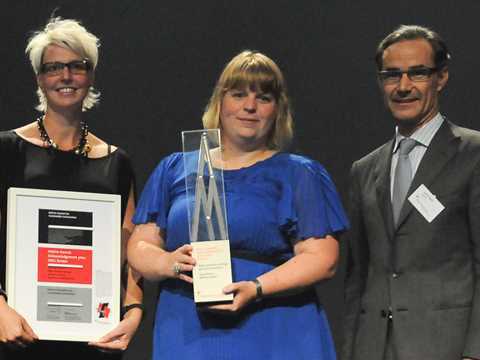 Receiving the Holcim Awards Acknowledgement prize 2011 Europe for High-density cottage garden structure, Appeltern, Netherlands (l-r): Marjan van Capelle of Atelier Gras and Marijke Bruinsma of De Stuurlui Stedenbouw, Netherlands from CEO of Holcim Belgium-Netherlands, Lukas Epple. 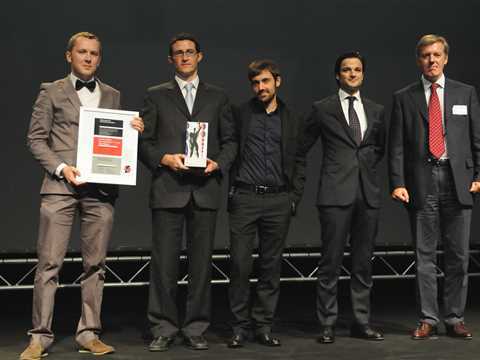 Gramazio & Kohler, Architektur und Digitale Fabrikation – ETH Zurich, Switzerland receiving the Holcim Awards Acknowledgement prize 2011 Europe for High-efficiency concrete formwork technology: (l-r) Fabio Gramazio, Silvan Oesterle and Axel Vansteenkiste congratulated by Kaspar Wenger, Holcim Switzerland. 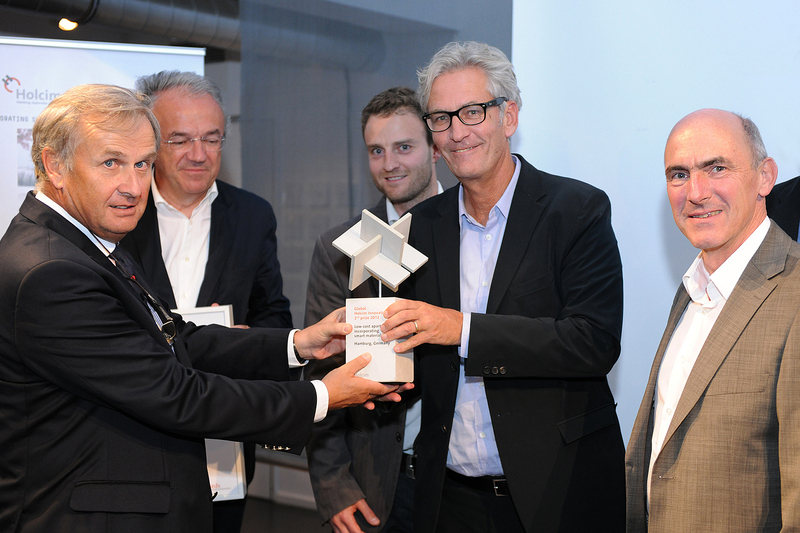 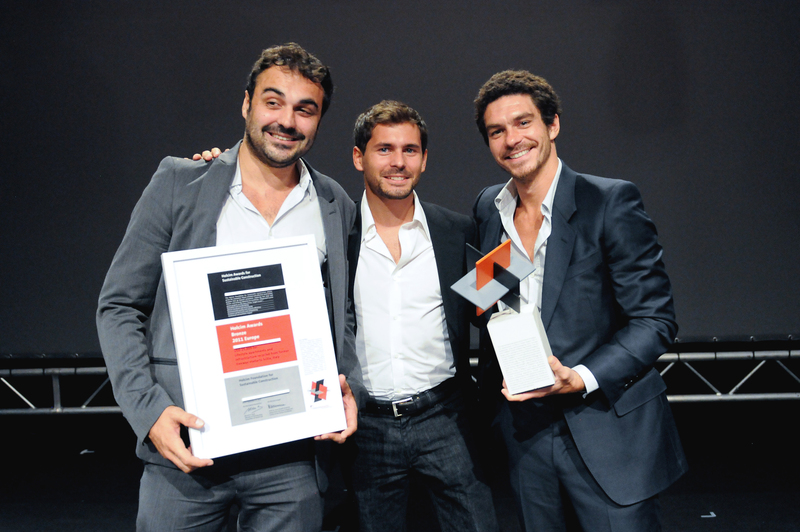 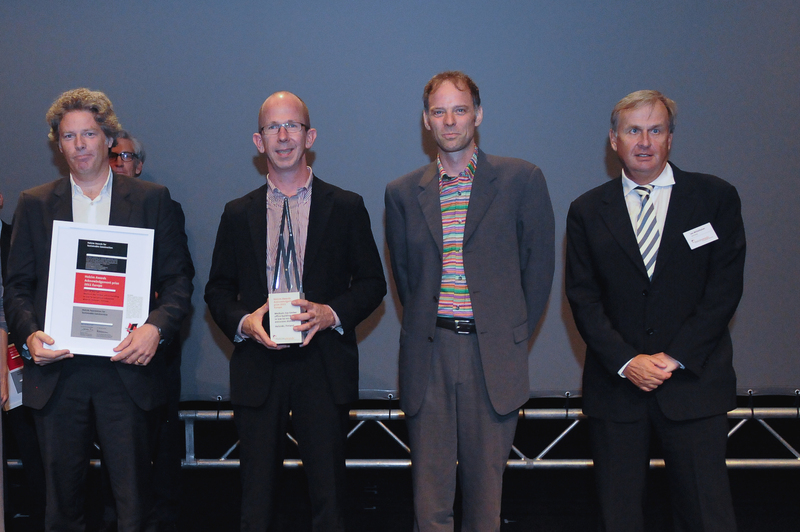 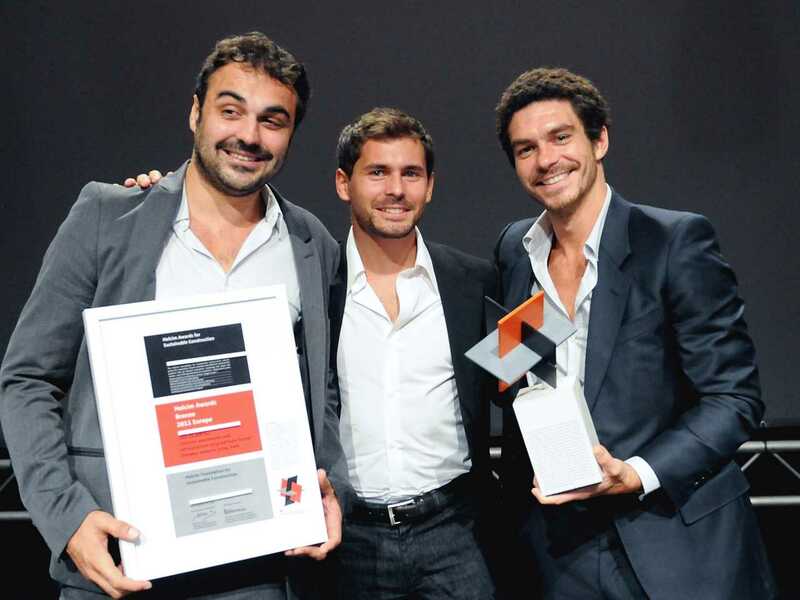 Holcim Awards 2011 Europe ceremony - September 15, 2011 - Milan, Italy; Receiving the Holcim Awards Acknowledgement prize 2011 Europe for Low-cost apartments incorporating smart materials, Hamburg, Germany (l-r): Mike Schlaich, Schlaich Bergermann und Partner and Frank Barkow, Barkow Leibinger Architects, Germany from CEO of Holcim Germany, Leo Mittelholzer. 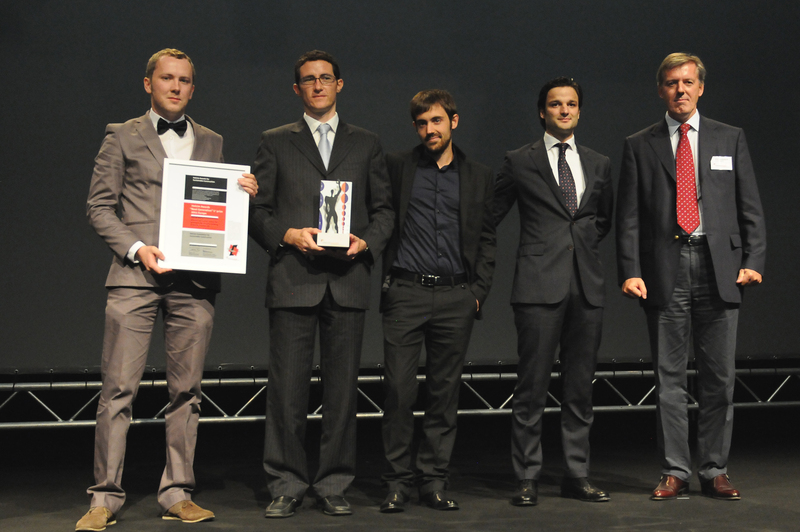 Holcim Awards 2011 Europe ceremony - September 15, 2011 - Milan, Italy: Receiving the Holcim Awards Acknowledgement prize 2011 Europe for Medium rise timber office building in low-to-no carbon emissions district, Helsinki, Finland (l-r): Juan Lucas Young, Andrew Kiel and Jan-Christoph Zoels from CEO of Holcim Germany, Leo Mittelholzer. Holcim Awards 2011 Europe ceremony - September 15, 2011 - Milan, Italy: Receiving the Holcim Awards "Next Generation" 1st prize 2011 Europe for Efficient fabrication system for geometrically complex building elements, London, UK (l-r): Povilas Cepaitis, Diego Ordoñez, LLuis Enrique, and Carlos Piles, AA School of Architecture, United Kingdom from Alain Bourguignon CEO Aggregate Industries UK. 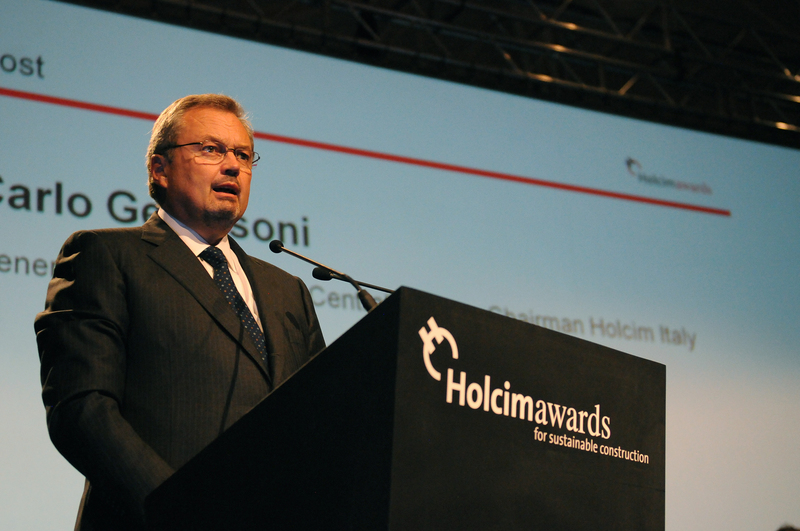 Holcim Awards 2011 Europe ceremony - September 15, 2011 - Milan, Italy: Presentation of the Holcim Awards "Next Generation" 2nd prize 2011 Europe for Materials reuse and regional transformation scheme, Gijón / Xixón, Spain (l-r): Head of the Technical Competence Center of the Holcim Foundation and member of the Holcim Awards jury, Hans-Rudolf Schalcher, Switzerland; prize winner, Elisa de los Reyes Garcia, Universidad Politécnica de Madrid, Spain; and CEO of Holcim Spain, Vincent Lefevbre. 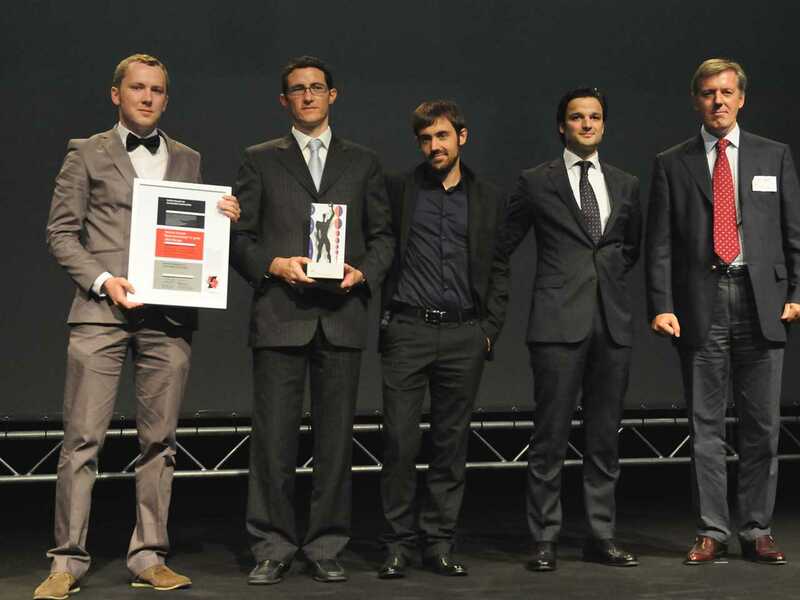 Holcim Awards 2011 Europe ceremony - September 15, 2011 - Milan, Italy: Presentation of the Holcim Awards "Next Generation" 3rd prize 2011 Europe for Bioluminescent devices for zero-electricity lighting, Seville, Spain (l-r): Head of the Technical Competence Center of the Holcim Foundation and member of the Holcim Awards jury, Hans-Rudolf Schalcher, Switzerland; prize winner, Eduardo Mayoral, Universidad de Sevilla, Spain; and CEO of Holcim Spain, Vincent Lefevbre. 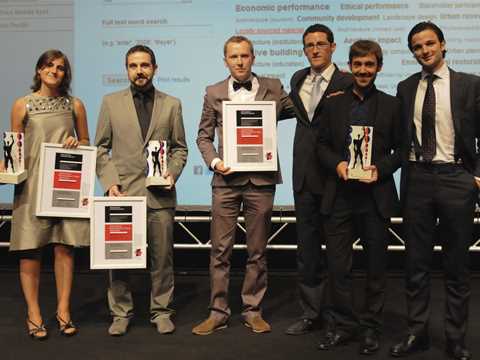 Holcim Awards 2011 Europe ceremony - September 15, 2011 - Milan, Italy: Representatives of all "Next Generation" prize winners for the Holcim Awards 2011 Europe (l-r): Elisa de los Reyes Garcia (2nd); Eduardo Mayoral (3rd); and Povilas Cepaitis, Diego Ordoñez, LLuis Enrique, and Carlos Piles (1st). 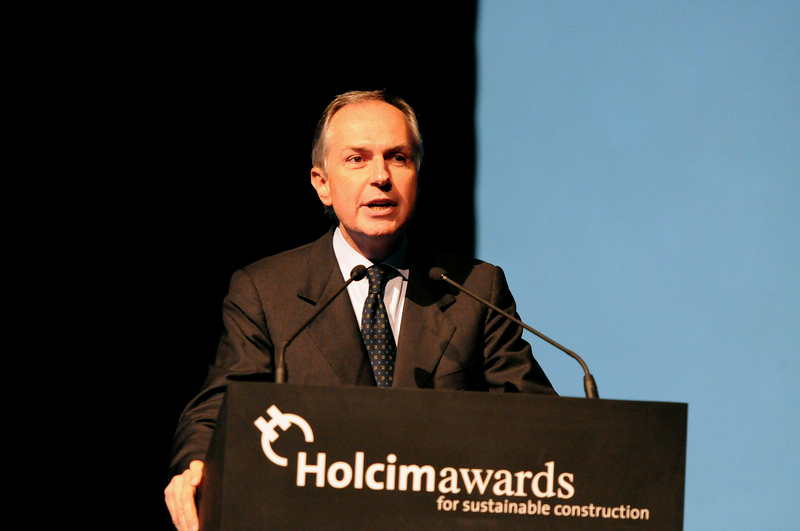 Benoït-Henri Koch, Member of the Executive Committee, Holcim Ltd, Switzerland – welcome on behalf of the Holcim Foundation and its sponsor. Lucia Castellano, Chief Councillor of the City of Milan for Housing, Municipal Property and Public Works, Italy - welcome on behalf of the City of Milan. 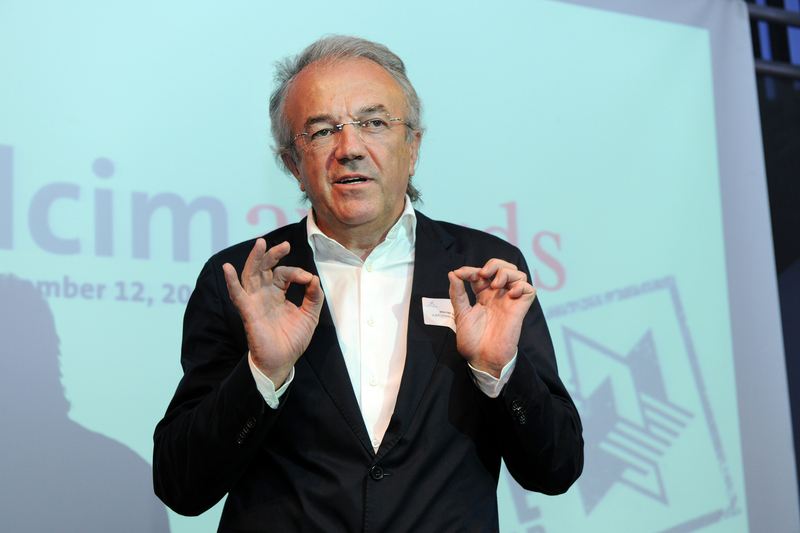 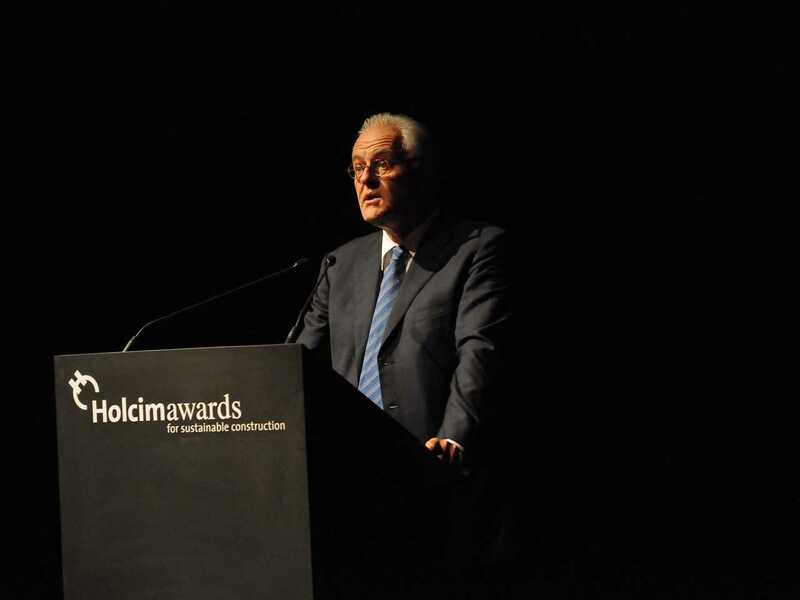 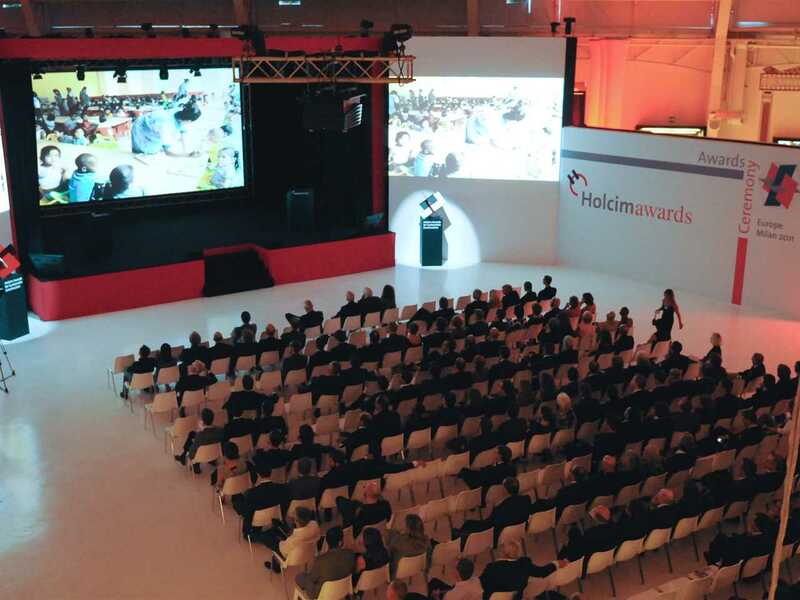 Pietro Guindani, Chairman of the Board, Vodafone Italy – keynote address at the Holcim Awards 2011 Europe ceremony. 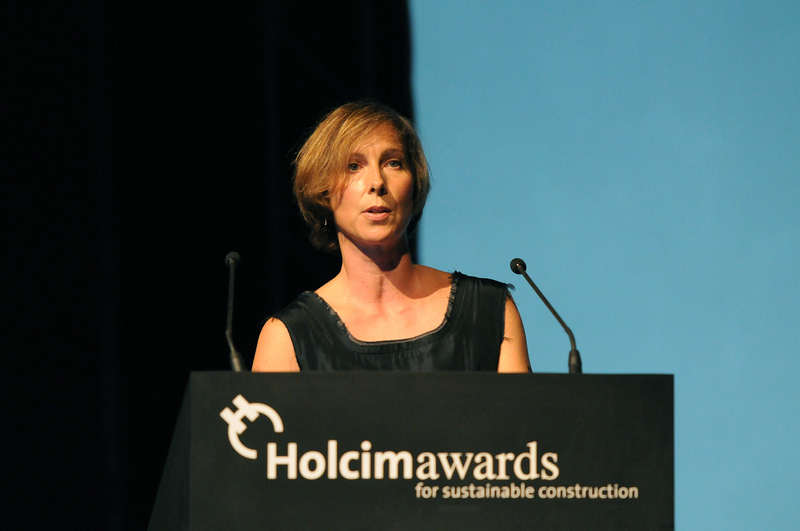 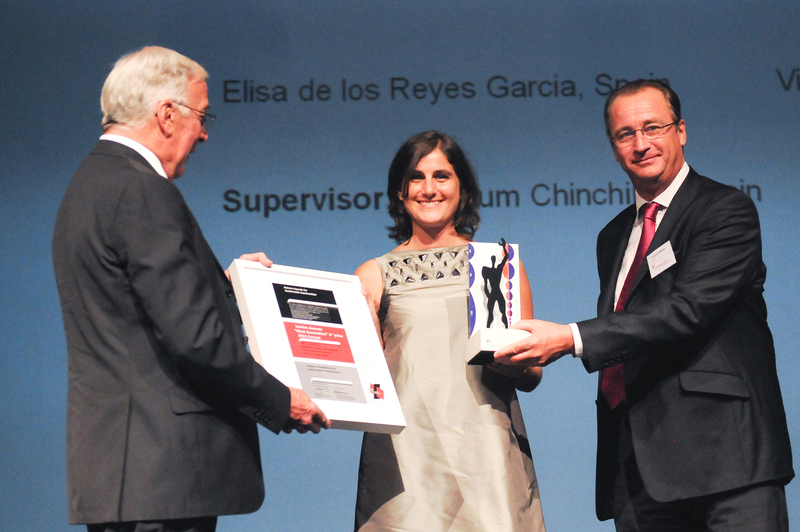 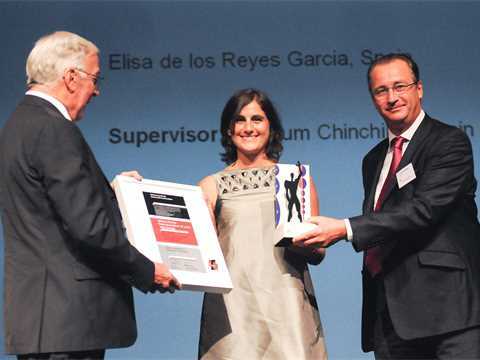 Lucy Musgrave, Co-director of Publica, UK and member of the Holcim Awards 2011 Europe jury – presentation of the Holcim Awards Gold, Silver and Bronze prizes. 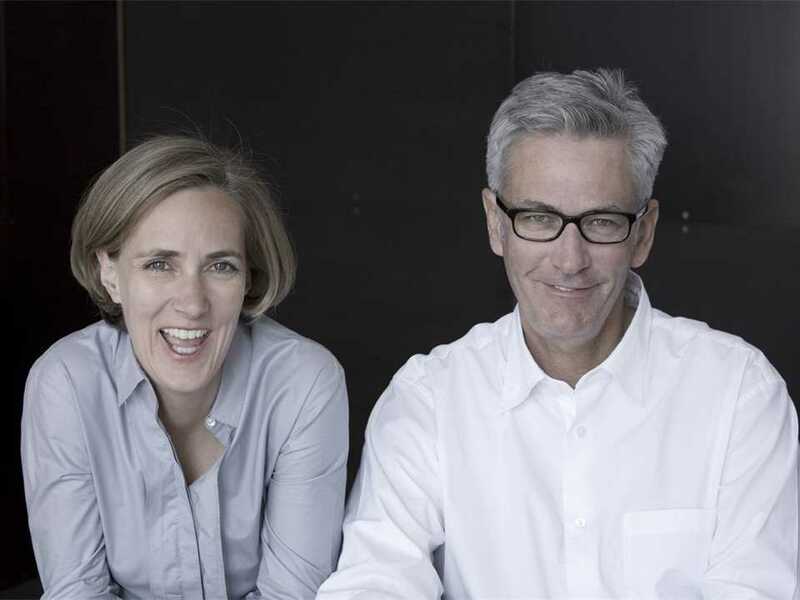 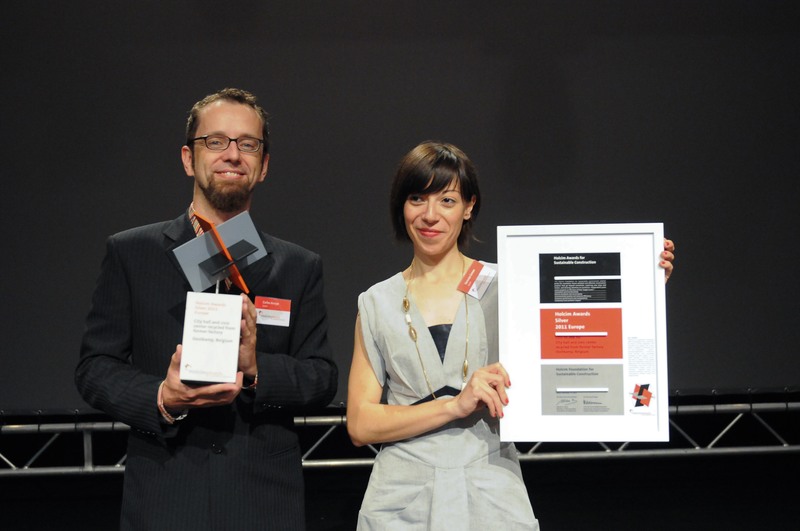 Alexander Biner, Partner at MS Management Service AG, Switzerland, and member of the Management Board of the Holcim Foundation (left) and Marta Malé, Institute for Advanced Architecture of Catalonia (IAAC), Spain; Architectural Association (AA), UK; and member of the Holcim Awards 2011 Europe jury – presentation of Acknowledgement prizes. 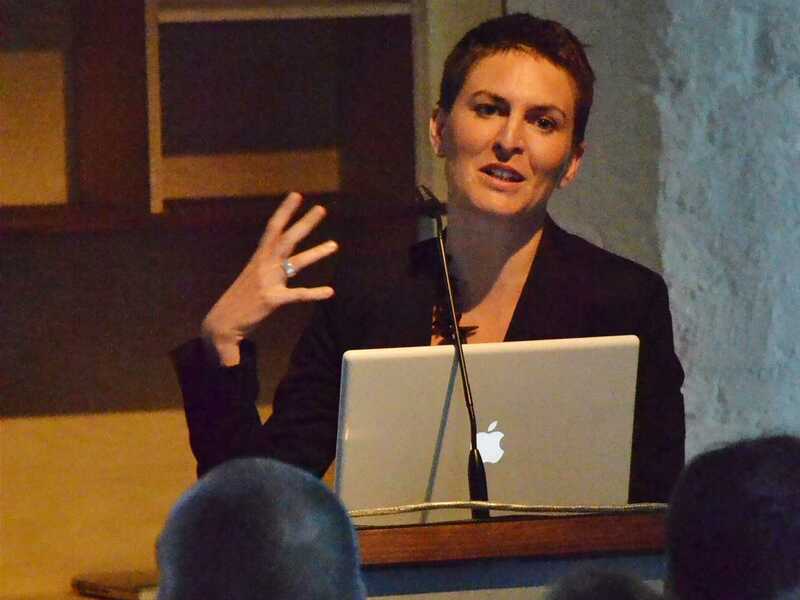 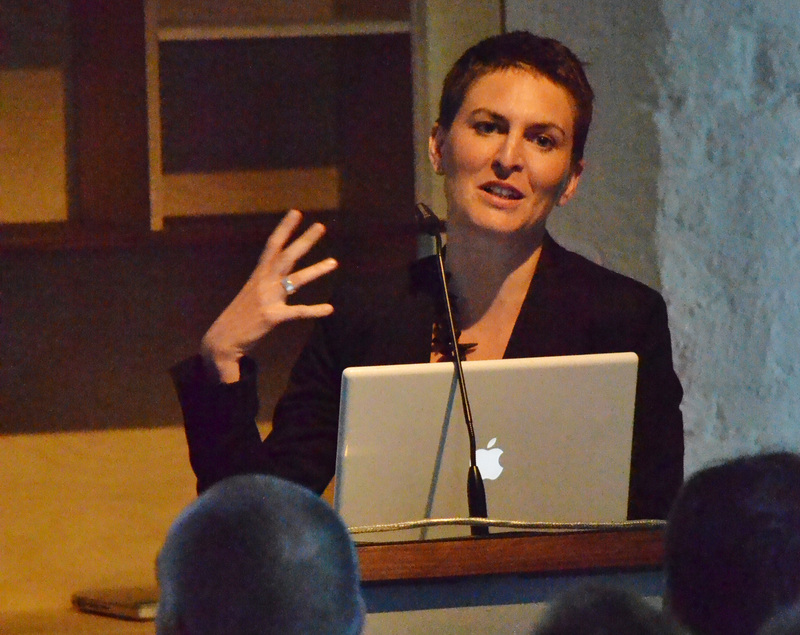 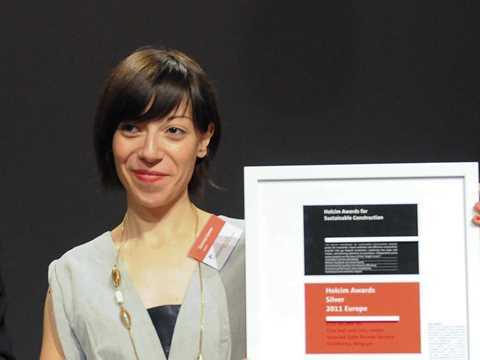 Marta Malé, Institute for Advanced Architecture of Catalonia (IAAC), Spain; Architectural Association (AA), UK; and member of the Holcim Awards 2011 Europe jury – presentation of Acknowledgement prizes. 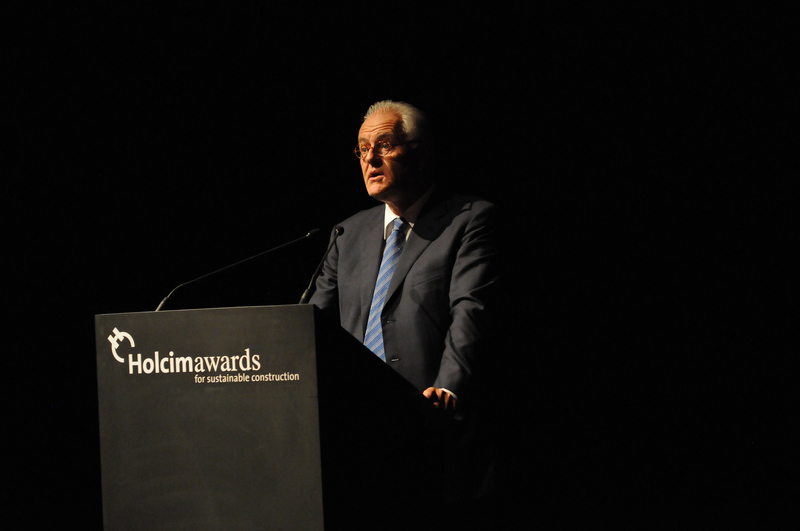 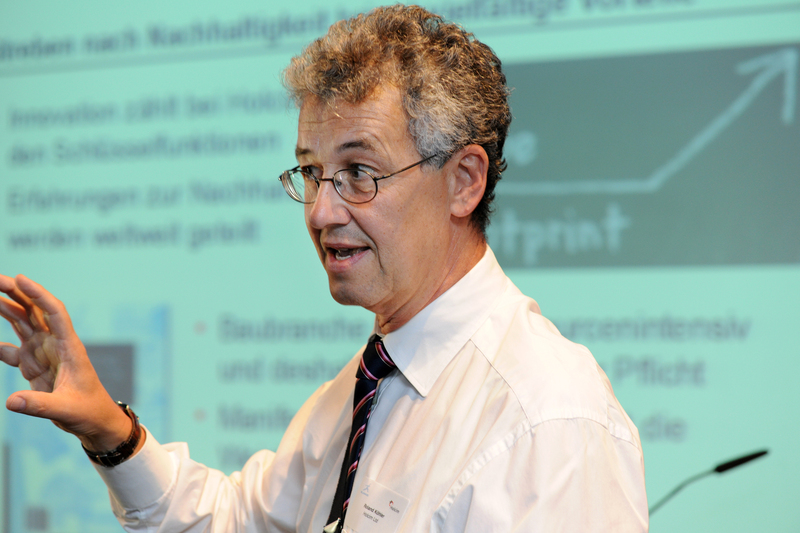 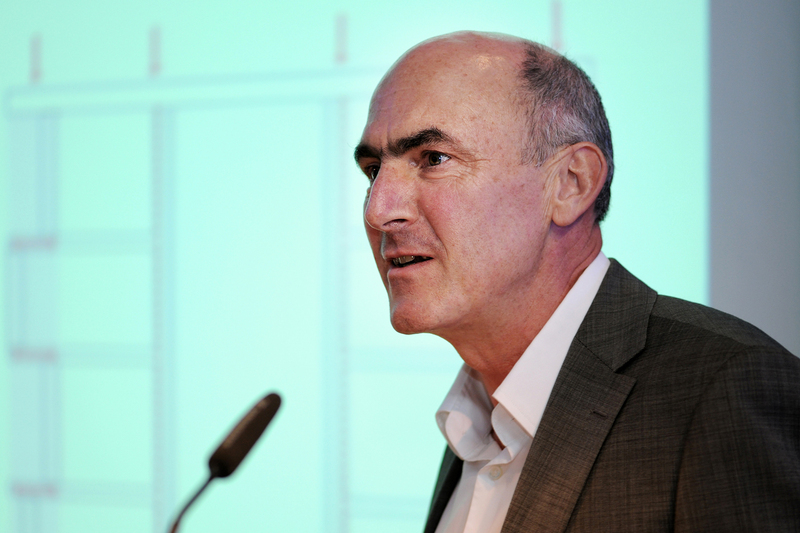 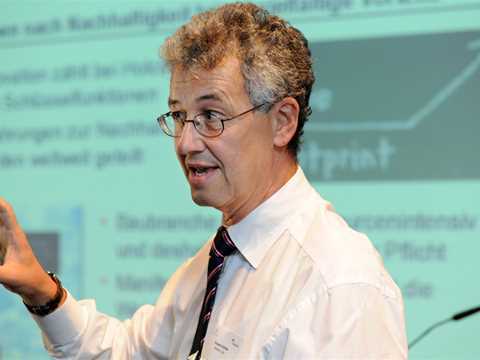 Hans-Rudolf Schalcher, Professor em., Department of Civil, Environmental and Geomatic Engineering, Swiss Federal Institute of Technology (ETH Zurich), Switzerland, member of the Management Board of the Holcim Foundation and member of the Holcim Awards 2011 Europe jury – presentation of the “Next Generation” prizes. 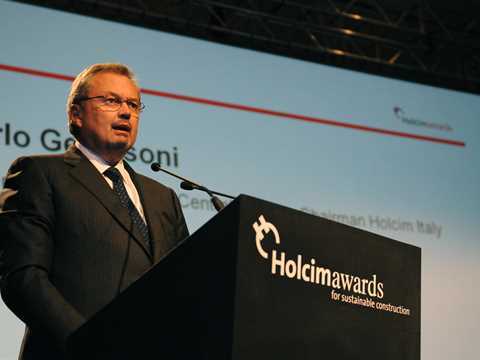 Carlo Gervasoni, General Manager, Holcim Central Europe – closing remarks and farewell. 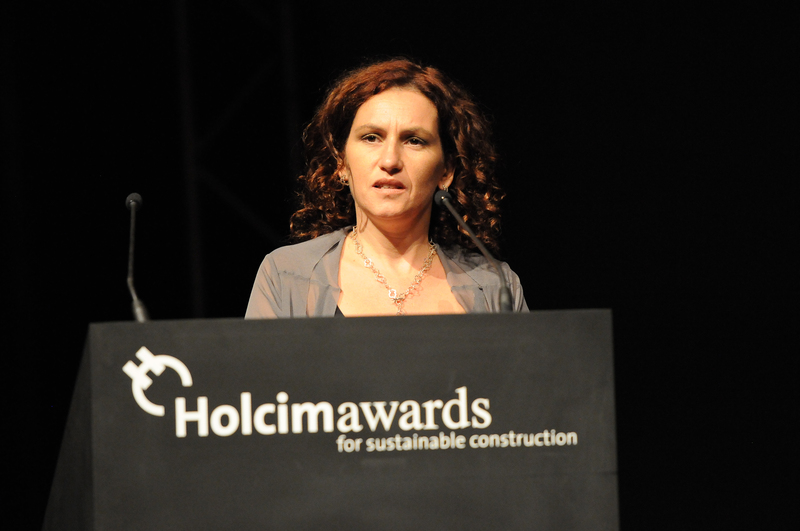 Paola Maugeri, Master of Ceremonies. 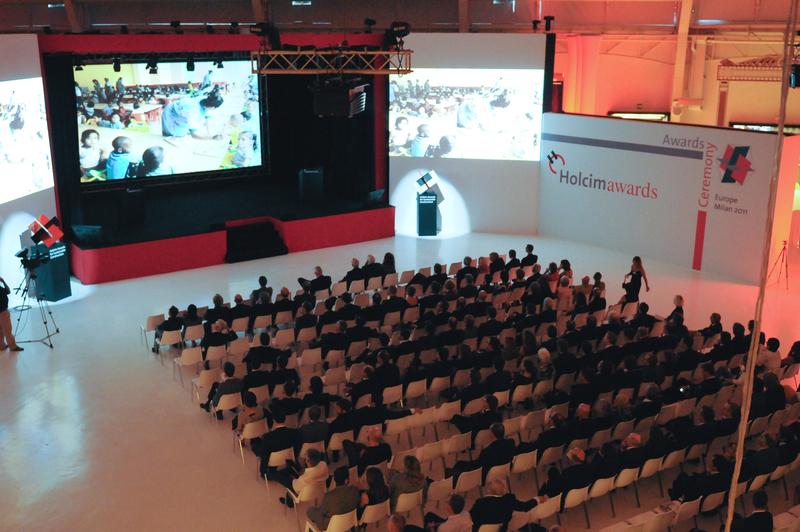 Holcim Awards ceremony at the Palazzo del Ghiaccio, Milan. German firms Barkow Leibinger Architects, Schlaich Bergermann und Partner, and TRANSSOLAR Energietechnik received a Holcim Awards Acknowledgement prize for their collaboration on low-cost apartments in Hamburg. The project uses innovative techniques and materials including pre-fabricated lightweight-concrete elements with recycled foamed glass as an internal aggregate. 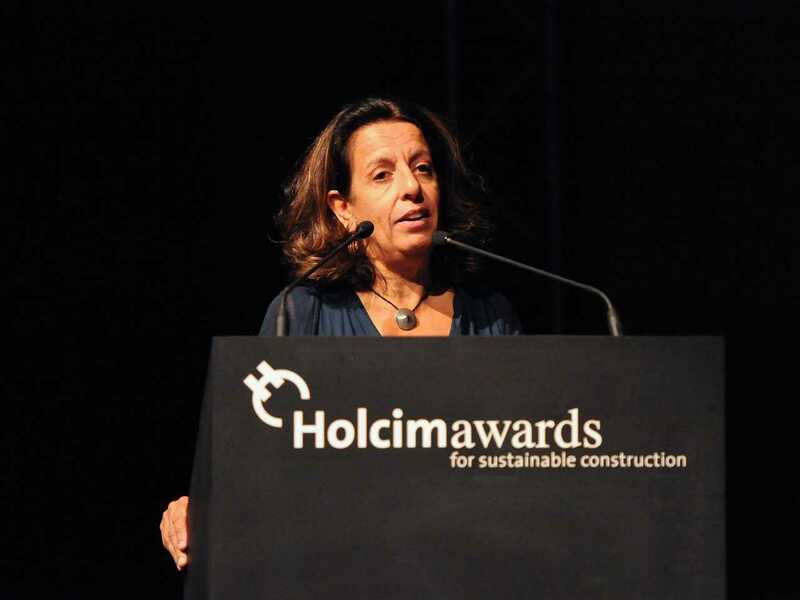 The jury identified the strength of the project in its innovative concept for construction and material that uses pre-fabricated lightweight-concrete elements which incorporate recycled foamed glass as an internal aggregate. 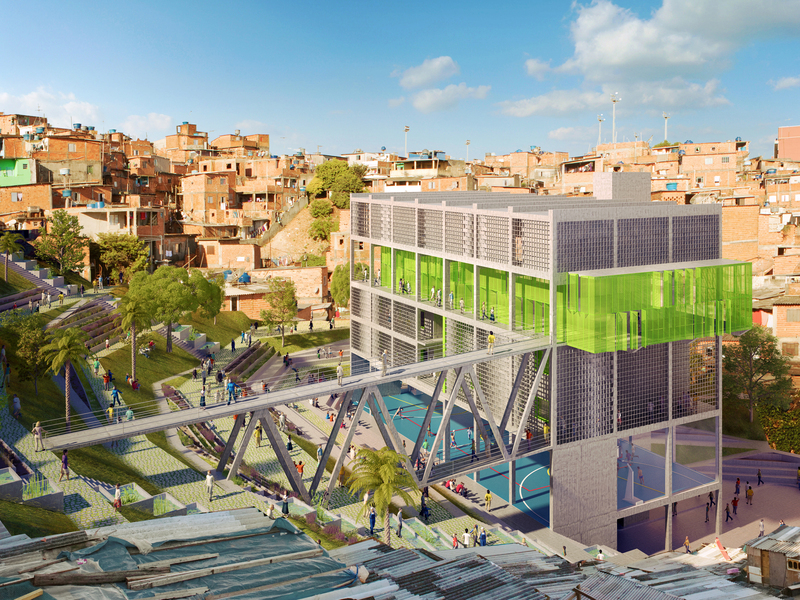 On top of that is an overall design scheme with competent solutions for a public housing development in every relevant aspect – an ambitious design and a zero-carbon energy concept even in the context of lower-income communities. Project entry 2011 "Low-cost apartments incorporating smart materials", Hamburg, Germany: View inside apartment. Project entry 2011 "Low-cost apartments incorporating smart materials", Hamburg, Germany: View from the street. 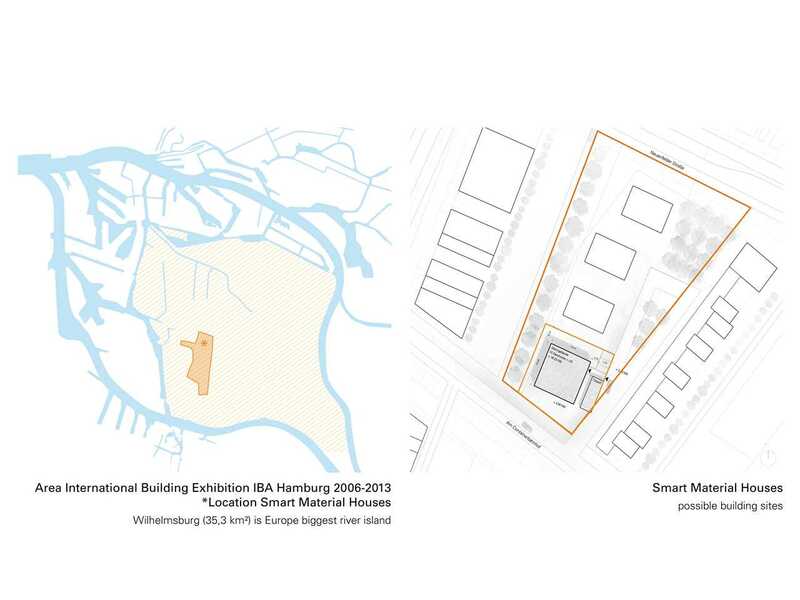 Project entry 2011 "Low-cost apartments incorporating smart materials", Hamburg, Germany: Location and site plan. 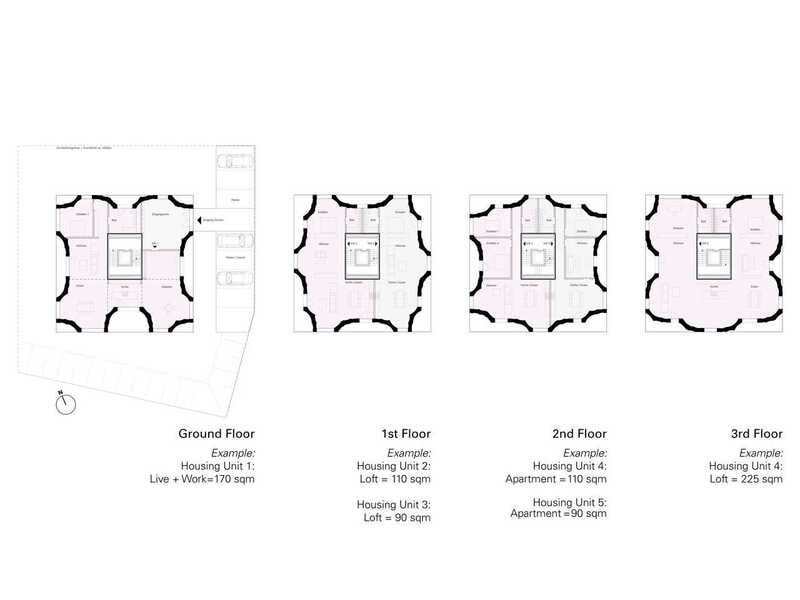 Project entry 2011 "Low-cost apartments incorporating smart materials", Hamburg, Germany: Floor plans. 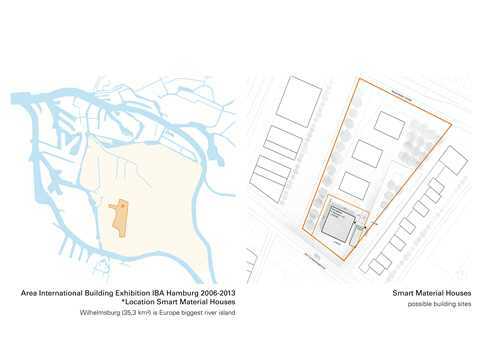 Project entry 2011 "Low-cost apartments incorporating smart materials", Hamburg, Germany: Construction. Project entry 2011 "Low-cost apartments incorporating smart materials", Hamburg, Germany: Material combination. 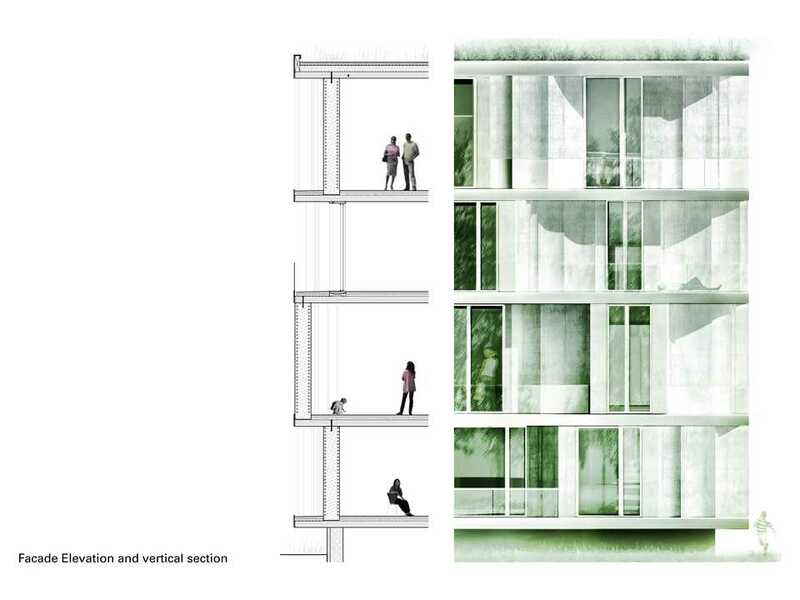 Project entry 2011 "Low-cost apartments incorporating smart materials", Hamburg, Germany: Façade detail. 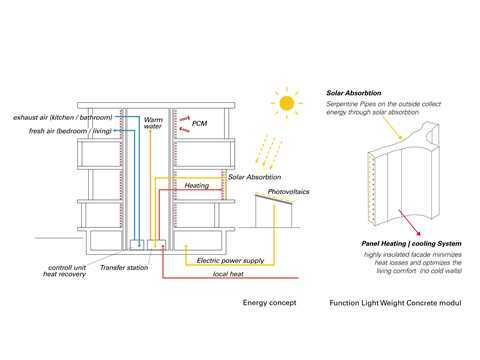 Project entry 2011 "Low-cost apartments incorporating smart materials", Hamburg, Germany: Energy concept. 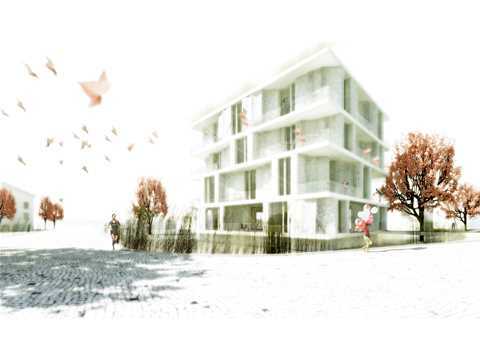 Project entry 2011 "Low-cost apartments incorporating smart materials", Hamburg, Germany: Model. Project entry 2011 "Low-cost apartments incorporating smart materials", Hamburg, Germany: Model detail. Project entry 2011 "Low-cost apartments incorporating smart materials", Hamburg, Germany: Team image. The units range in size between 90-225sq m and incorporate fast-growth fir decking slabs with pre-fabricated infra-lightweight concrete walls. 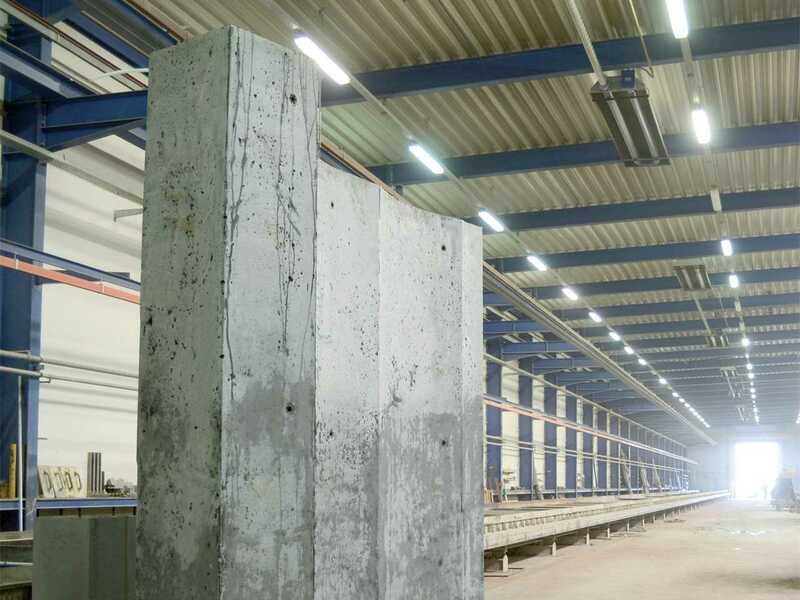 The lightweight concrete is one-third of the weight of conventional concrete, is self-insulated utilizing recycled foamed glass as an internal aggregate and allows the building to approach a zero-carbon material effect. The walls are embedded with tube conduits to provide conductive heating and cooling via water, triple-glazing improves sound and heat insulation, and the roof is planted with local vegetation. 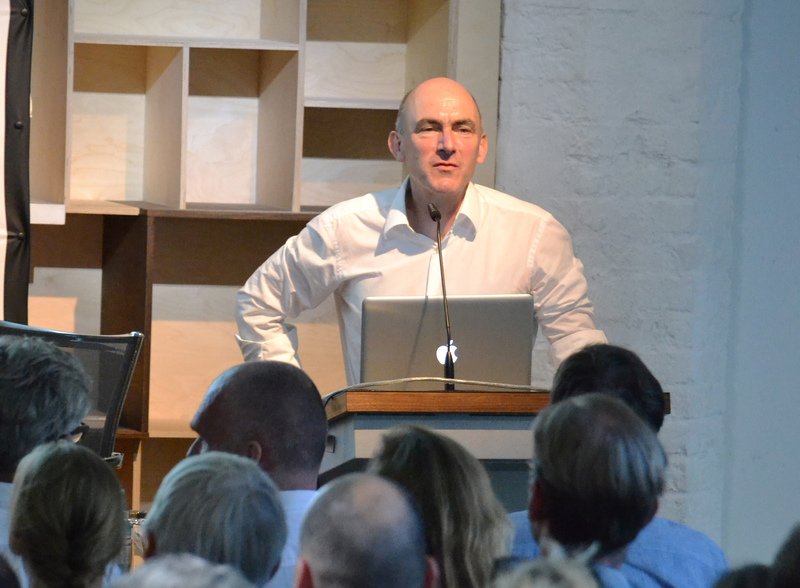 Frank Barkow: "How do you build sustainably and create 'good' architecture?"